CHAPTER I. 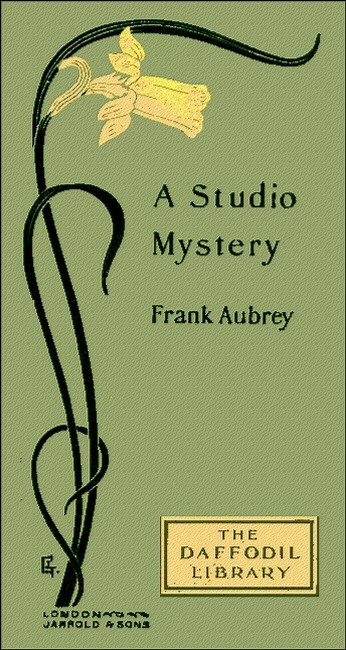 THE MURDER IN THE STUDIO. CHAPTER III. TAKING UP THE SCENT. CHAPTER IV. A STRANGE TALE. CHAPTER VI. ROSE MAKES A SUGGESTION. CHAPTER VIII. THE CIRCLE NARROWS. CHAPTER IX. A HOUSE OF SICKNESS. CHAPTER X. ALONE IN THE STUDIO. I. — THE MURDER IN THE STUDIO. JUST off the Marylebone Road, not far from the top of Portland Place, is a quiet, retired square which forms, as it were, a cul-de-sac. You can only enter or leave it at one corner; and in the opposite corner stands—or stood a few years ago—a large old-fashioned house, surrounded by a small garden. On both sides of this house blank walls extended for some distance between it and the other houses in the square—these walls shutting off two large buildings, public institutions of some kind, that had their chief entrances in other streets. The old house thus stood isolated in its corner, with an air of having shut itself off from other habitations in a fit of sulky discontent with its own fallen fortunes. For it was very different in structure and appearance from the more modern residences on the remaining sides of the square. The ground or garden in front was uncared for and weed-grown. A pathway or carriage drive curved round from gate to gate, one on either side, to the broad flight of steps that led up to the front door. The house itself, too, was gloomy and dilapidated in its general appearance. It impressed you with the conviction that it had "seen better days;" that it had retired to this corner to meditate undisturbed upon its former glories and ancient grandeur; and it seemed to protest in moody, but dignified silence against the fate that had brought it down from its former high estate. On the night when this story begins the snow lay thick upon the ground, and the air was keen; but a full moon, riding high in the sky, lighted up the scene with a radiance that made the lights in windows and street lamps appear ruddy by comparison. In the garden in the middle of the square the leafless branches moved slightly to and fro, now and then, when a light, but icy, breeze came sweeping past, the shadows tracing quaint, every- changing, lace-like patterns on the snow beneath them. The clocks around tolled out midnight, and in the hush, due to the muffling by the snow of the usual sounds of traffic from the neighbouring streets, one could hear chimes and bells ringing out the hour in all directions—some close at hand, others far away in the distance; then, when all had finished, the square could not have seemed more quiet, had it formed part of a country village, although it was within a few hundred yards of busy, restless London thoroughfares. The silence was soon broken by the sound of voices, intermixed with snatches of comic songs, sung or whistled, and growing louder with the appearance in the square of two men in Inverness capes. They seemed to be in high spirits, and their talk and attempted musical interludes suggested that they had been having a pleasant and merry time of it. They passed the nearest houses and were now walking alongside one of the high walls, evidently bound for the large detached house in the corner. "What a grand dancer that Lanelle is, isn't she?" said one of the two. "I don't think I ever saw such a clever dancer. And for grace! She beats Carina all to nothing. That's my opinion. Don't you think so, Fred?" "Well, I don't know as to that," returned the other, "but certainly she's out of the common. She's not so good looking, I think, as Carina; and besides—Hulloa! Who's this?" The speaker had turned round at the unexpected presence behind them of someone whose footsteps had been so deadened by the snow, that he had come up quite close before they were aware that they had been followed. "C'est moi, Monsieur Duncan," said the newcomer with a deferential bow. "Permit, sare, that I go to open ze door for you." "Ah, Gustave," said the one whom he addressed, "what brings you out so late, eh? Been to post letters or something?" "No, sare. I have been out all ze evening. Mr. Arnold he give me leave to go out to-night to give my what-you-call—sweetheart- -a treat, because it's her day of birth." "Your sweetheart's birthday, eh? Lucky dog to have a sweetheart and to be able to take her out. Where have you been? To the theatre, I suppose?" "Oh, to the Alhambra? Then you saw one we were just talking about—Carina? What do you think of her dancing?" "C'est superbe, sare. The finest I have ever seen; I knew not before there was one so splendid in London." "Ah," put in he who had been addressed as Fred, "you should have gone to the Empire and seen the one we saw there to-night— Lanelle; she beats Carina all to fits." "If that is so, monsieur, I shall go zere ze next time I shall be able. Voilà, Monsieur!" and the speaker, throwing open the door, stood respectfully aside to allow the others to enter. The spacious hall was lighted by a gas lamp; at the end was a broad oak staircase, up which Gustave went, after bidding the others good night; while they entered a door on the right, and one turned up the glimmering gas jet that had been left ready- lighted against their return. The two were Fred Duncan and Richard Foster, and both were artists. They occupied between them all the ground floor; indeed, the whole house was let out in flats, or floors, to artists. Two of these, who had the first floor, were named George Arnold and Herbert Darrell; and Gustave, the foreigner who had returned at the same time as the two first named, was Arnold's factotum—a sort of combination of valet, cook, general servant, and, on occasion, model. The ground and first floors ran out some distance to the back, and on each was a suite of rooms shut off by one door; but above, the floors were smaller. On the second floor was an artist named Hedley who had two rooms, the remaining two being let to a tenant who was at this time away. The top floor was empty, with the exception of one room, which Gustave used as a bedroom. When Foster had stirred up the fire, which responded by sending a cheerful blaze flaring up the wide chimney, he said to his friend while they were talking off their wraps. "Funny Gustave should be out to-night." "Why?" inquired the other indifferently. "He's got a very indulgent master. Arnold often lets him off for the evening." "Yes; but Arnold's going away to-morrow for a month or two. You'd have thought he would have wanted some packing done, or something. "I suppose Gustave pleaded specially hard on account of its being his sweetheart's birthday, as he informed us so fully. By the way, what countryman is Gustave? Can you make out? Hanged if I can. He always says himself that he's French, but I know to a certainty that he can jabber Italian just as well as he can French, because one day in the summer, when the window was open, I heard him having a long jaw outside with an Italian organ- grinder. I was not close enough to hear what was said, except for a few words here and there, sufficient, however, to show they were talking Italian, and that Gustave can gabble away in it just as fluently as he does in French." "I'm sure I don't know," returned Foster, "and I'm equally certain the matter doesn't trouble me. Only, if I were Arnold— Good heavens! What's that?" "Messieurs, Messieurs! Ah, nom de Dieu! My master! Ah, ze poor master. Dead! Murdered, I fear! Ah, come to him. Come quickly. Nom de Dieu!" Following him up the stairs and along a passage, they entered the large studio occupied by Arnold and Darrell. There a terrible sight met their eyes. Upon a small bedstead that stood in one corner lay extended upon its back the form of George Arnold, with the front of his clothing covered with blood, which also had run down on to the bed and the floor. Over him stood Herbert Darrell, muttering incoherently, and seemingly scarcely in his right senses. He, too, was blood-stained, both as to his hands and his clothes; his hair was disordered, and he was but half-dressed, and had on neither boots nor slippers. Duncan went up to Arnold's side and took hold of his hand. He found that it was already stiff and almost cold. "Good God, Darrell!" he exclaimed, "what terrible thing is this? What do you know about it? Speak, man, for God's sake? What—? Oh, Foster, send Gustave off for a doctor at once. I fear 'tis too late. He's dead—been dead some time; but—still—send Gustave at once!" Gustave darted off, leaving the two horrified men alone with Darrell, from whom came only the words, "He did it. That thing there. I saw it—saw him strike, but was not in time! He did it! He did it! I always said so; and I saw him do it!" The two listeners stared incredulously at Darrell, who pointed to a lay figure at the other end of the studio on a sort of raised platform that ran across the whole width of the room. The figure was realistically dressed as a brigand, with a wax mask upon the face that gave it an almost life-like appearance. It was seated upon what represented a boulder of rock, with other rocks and shrubs around and a painted background, the whole forming a well-conceived and well-executed scene or picture. Across the front of the platform ran a rod with a curtain upon it, but this had been pulled quite back to the wall on one side. Suddenly Darrell sprang to the side of the studio near the fireplace, and taking down an old broad-sword hanging against the wall, made a rush at the lay figure, and, in a seeming access of frenzied rage, cut and hacked at it with terrible fury. The figure fell over on to the ground, the mask came off and rolled one way, and the wooden head another; but he continued to hack at the rest, and had broken it almost to pieces before the two witnesses of his extraordinary acts could interfere and get the sword away from him. By the time this had been done, Gustave returned, accompanied by a doctor and a policeman, the latter being followed, shortly after, by another and a sergeant. But neither doctor nor policeman could do aught for poor George Arnold. He was dead—killed by a deep stab in the breast; and all that was left for them was to discover the murderer and bring him to punishment. It seemed an easy thing enough to do this; so at least thought the police, for Darrell had been taken almost—indeed, only too literally—red-handed, and the sole doubt appeared to be whether he had done it in his sober senses, or, as looked more probable, in a fit of homicidal mania. At any rate, an hour later, Darrell was charged at the Marylebone police station with the murder of his friend and chum, George Arnold. MATTHEW GRIMLOCK sat in his sanctum on the day following the tragic death of George Arnold, apparently deeply engaged in some papers spread out before him; but, in reality, staring blankly at them and seeing nothing. His thoughts were far away, and words and half-sentences, that escaped him now and then, indicated that he was pondering upon the strange circumstances surrounding the murder. Grimlock was one of the class known as private detectives—and a celebrated one. To his offices in a side street leading out of the Strand, came many from far and near, to seek his aid in all kinds of difficulties and troubles. He had had a long and extensive experience, was known to be honest and faithful to those employing his services; but he had been so successful that he had for some time contemplated retiring, and only a sort of inborn love of puzzling out difficult problems had kept him from carrying out his half-formed intention. As it was, he now accepted only such cases as happened to interest him, declining many that were pressed upon him, no matter how liberal might be the remuneration offered. Therefore he was not easy of approach in such matters, and the comparatively few who succeeded in inducing him to lend them his assistance deemed themselves fortunate. In appearance there was nothing at first sight very remarkable about him. About middle height, neither stout nor thin, yet of muscular build; he showed no sign of age, save, perhaps, the iron-grey colour of his closely-cut hair. Nor was there much in the clean-shaven face to serve as an index to the casual observer, unless it were, to be paradoxical, a curious impassiveness when the features were in repose. But, if one looked a little deeper—especially if one watched him when talking upon any subject that interested him—there was a keenness in the steady glance of the grey eyes, and a firmness about the mouth and chin that were irresistibly suggestive of latent power and repressed energy. In the midst of his meditations there came a knock at the door, and in response to his sharp, "Come in!" a clerk entered, bearing a note which he handed without remark to his principal. Grimlock took it, opened it, and read it; then sat for a minute drumming with his lingers upon the table. "Who is it that has brought this, Perkins?" he presently asked. "Two ladies, sir," laconically answered the clerk. "Look like mother and daughter." "Mother and daughter, eh? H'm, well—show them in." "Yes, sir!" and Perkins went out, but returned almost immediately, ushering in an elderly lady in widow's weeds, and a very charming, but very pale and sorrowful-looking young girl, dressed in a sort of half-mourning; from their appearance they were ladies of good position. "Yes, sir," answered the one addressed, "and my daughter," indicating her companion. "I see this letter is from Dr. Selby. What is it you wish to see me about?" "It's about that dreadful affair of Mr. Arnold. He was a friend of ours—and so is—Mr. Herbert Darrell." "I see," replied Grimlock. "But what is it you require?" "We have heard, sir," answered Mrs. Chester, "of your skill in investigating matters of this kind. Also of the difficulty there is now in prevailing upon you to take up a new case." "Dr. Selby, who is also a friend of ours, said that, perhaps, at his suggestion and recommendation, you might make an exception in our case—and we know of what value that might be to us—and we thought that, perhaps, when you had heard—that is—when you know how we are connected with this dreadful business, you might- -that is, Dr. Selby said he hoped you would—take it up for us. Money is not an object, compared—"
"Oh! do not refuse, sir! Do not say no! Wait—wait before you answer. You do not know—you cannot tell what this may mean to us, and to—to—another—it may be life or death. Oh, sir, say— say you will help us in this awful trouble." The mother got up and put her arm tenderly round the girl, who was trembling so that she could scarcely stand. "Rose, my child," she said soothingly, "sit down. You are over-excited. You must not upset yourself. Sit down and be quiet a moment, while I explain to this gentleman. He cannot possibly say either yes or no, until he knows what it is we want;" and she tried to lead her back to her seat. But the girl pushed her gently from her and fixed her eyes on Grimlock, waiting in a strained agony of hope and fear for his answer. Her eyes wandered from his face around the room, then back to meet his, reminding Grimlock, who was narrowly observing her, of the pathetic look of a hunted hare. "Come, come, Miss Chester," he said kindly, "do as your mother asks you. I see you are both in great distress, and, if I see my way to help you, I may be willing to do so. But we shall never get on, if you do not allow your mother to explain matters, you know." Somewhat re-assured by his tone, she went back to her seat; and Mrs. Chester re-commenced, this time more firmly. "We have known both Mr. Arnold and Mr. Darrell for many years, and know them to have been firm and affectionate friends, who never had quarrel or difference of any kind, and both high- spirited, honourable English gentlemen. George Arnold, however, was the stronger of the two, both physically and, in a sense, mentally—at least since a visit they paid to Italy some two years ago. They there met with an unhappy adventure, which so affected Mr. Darrell that he had brain fever, since which he has been in a very weak state of health, and, as I have heard, has been somewhat given to strange superstitious fancies. "Mr. Darrell is engaged to my daughter—my only child, who has come here with me to-day; you can understand, therefore, how this tragic affair has affected her. We live at this address in the Bayswater Road. Dr. Selby, who was friendly with these two young gentlemen, came to us this morning to break the sad news and to urge us to see you without delay. He said he was sure that, if any man in London could help us, you were that man; but he also warned us not to be too sanguine of persuading you to aid us, for he knew that you were now refusing people every day." And Mrs. Chester handed Grimlock a slip of paper on which she had written her address. Matthew Grimlock glanced at the paper, nodded his head, and then looked compassionately at Rose. "I will do what I can," he said, waving his hand to stop Rose from jumping up to come over and thank him, which he saw she was about to do, "but I fear there is little to be done. So far as appears, the case is terribly against your friend Mr. Darrell. Still, I see two or three doubtful, or rather, curious points; and, I may tell you, I had already thought of looking into the matter on my own account, because it interested me, and also because my friend, Dr. Selby, is mixed up in it. Indeed, I live near him, and he called me in there early this morning, so that I was early on the scene, and made a careful investigation with him, before the detective from Scotland Yard arrived. No thanks, therefore, are due to me from you for taking the matter in hand; indeed, I shall feel greater interest in it now that I have seen you and heard how you are situated. If there is any possible way to aid your friend Mr. Darrell, you may rely upon me it shall be found, if pains and patience and thought can arrive at it; but— and it is a cruel 'but'—I see no light ahead at present. The theory is that Darrell killed his friend, either while in a fit of homicidal mania, or, possibly, walking in his sleep. As you say, he had fancies, and it seems that the story he told about the lay figure, made up to represent a brigand chief, was but a further development of an old-standing phantasy he had got into his head about that same figure or model. It really does look as though he had allowed it to work upon his mind, until he dreamed of it night after night, and, finally, in his sleep, or in a fit of hallucination, himself carried out to its fearful end the fancy his own brain had evolved." Both mother and daughter remained silent for a while—the latter with her face buried in her handkerchief. While Grimlock had been speaking, her moods and looks had been a reflection of the words he uttered. First, thankfulness and gratitude, then interest, and, finally, a hopeless despair that caused her to lean her head on the back of her chair, and hide her tear-stained face from view. "If," she asked, "it should be proved so—or if it should be ultimately believed that that is the real truth of the matter— what would they do to Mr. Darrell?" "He would be confined in a lunatic asylum." "Ah, that I cannot tell you, my dear madam. 'During Her Majesty's Pleasure' is the usual phrase. It may mean anything—a lifetime, or less. But, in any case, it must mean a long time." "And, in any case, it must mean death to him, poor boy, sensitive and high-spirited as he is, and especially in his weak state of health. And that would mean, alas! I fear, for my poor child there, little better either;" and the mother sighed mournfully. Matthew Grimlock sighed too. He was not given to showing emotion, but to-day, somehow, for once, he was touched to the heart. The despairing, 'hunted' look he had seen on the sweet face of the young girl haunted him, and he could not put it from him. "It would be cruel," he said, "to raise hopes where I see none myself, so I cannot say more than I have already said. Certainly there are a few particulars I mean to look into; very slight— nebulous, at present; everything depends upon whether they lead one further, or stop dead where they are. They may be the entrances to a path that shall lead us where we hope to get, or they may be simply culs-de-sac—where you see 'no thoroughfare' clearly written up when you get a little further. One never can tell. One can only try—try everything, and neglect no point, however slight and unimportant it may at first sight appear. But all this demands time, and, for that reason, it is well that you have come to me at once." "Thank you, sir," said Mrs. Chester. "And since, as you say, such work requires time, it requires also money. As I said before, money must not stand in the way. If you will but tell me—"
Grimlock held up his hand. "I will take nothing, unless I succeed, in your case," he declared. "Then—if happily it be so— you could give what you pleased to cover any expenses incurred. That's all. Now I must be setting about it, for time is precious in such cases. I will let you know from time to time how matters progress, and—do your best madam to help your daughter to bear up." As they were going out, the young girl suddenly seized Grimlock's hand and pressed her lips upon it. "God bless you, sir, for the slight hope you have put into my heart, and for your kind feeling for us. I will try to do my part—to keep brave for Herbert's sake—while you are doing yours." "Ah, that is better talk, far," was Matthew's response. "Keep to that, my dear young lady—keep up a brave heart, and feel sure I am fighting your battle for you. They say a battle is never lost tilt it is won—or never won till it is lost, you know—and there is time yet for either." After the departure of the mother and her daughter, Grimlock remained awhile staring hard into the fire. Then he turned round to the papers on his desk, with a sigh. "Poor girl! poor child!" he said to himself, "I wish, for her sake, I could see more chance of success in this miserable business. I've seen many grief-stricken faces in my time—ah! how many! but I never saw one that affected me like hers. Gad! I'd give something instead of being paid, to be able to carry good news to her, to relieve her distress and see her poor face brighten up. What a treat to see that, if I should succeed! Now Matthew, my boy, if ever you bent your brains and your whole energies to a task, do it here. Brains and thought shall tell, if they're pitted against cunning plotters, in this case, as they have so many times before, my boy! It does not look cheerful at present, but, I've seen many turn out all right that looked no better. Come in!" This last exclamation was in response to a knock at the door. Perkins entered saying, "Mr. Burrell wants to see you, sir." "Ask him in," said Grimlock, and, a few moments later, Mr. James Burrell, a well-known member of the detective department of Scotland Yard, entered, and shook Matthew by the hand. III. — TAKING UP THE SCENT. JAMES BURRELL entered with rather a pompous mien; as a member of "the force" he affected to look down upon all "private" detectives. Still, he knew Grimlock to be not only a respectable, but an unusually astute member of the class; and indeed he had been indebted to Matthew, in times past, for more than one shrewd hint, in difficult cases, that had been the means of enabling him to achieve success and earn praise, when he would not otherwise have succeeded. Therefore the two were on friendly terms—though often rivals in certain instances. "I am much obliged to you for coming in response to my message," began Grimlock, "and, at the same time, glad you did not come sooner, for two persons have only just left me who are interested in the matter I wanted to see you about. It is the Arnold affair of yesterday, you know." Burrell nodded and fixed his eyes, apparently, upon the ceiling. It was a habit of his when talking. He never seemed to look at the person who was speaking to him. But some people said he could see better and "take in" more when he looked away from anything than others could by looking straight at it. He was a contrast to Matthew in many ways. Thus, he was stout, of florid complexion, and had reddish-ginger hair and whiskers. He was neither so well educated nor so well spoken as Grimlock—but he was straightforward, and, when he once gave his word, Matthew knew he could be relied upon to keep it to the letter. "When I sent to you," continued Grimlock, "I was going to ask you to let me help you in that business. But, since then, something has occurred to induce me to ask you to help me, and, in addition, I can offer you the chance of making a bit, if we succeed." "How so?" asked Burrell shortly, his eyes still apparently staring at the ceiling. "In this way. Certain clients offer to pay liberally, if anything can be done to get Darrell out of the trouble he is in— that is, if we're successful. I want to help them and I won't touch the money myself; but, if we can work together and effect anything, I'll hand all I get over to you, and that will make it worth your while. What do you say?" "I say that I am willing to help and halve it with you—on our usual terms, you know—but I see no chance of success. Not a shadow of a chance." The "usual terms" between these two, when they did strike a bargain of the kind, were that the Scotland Yard man was to have all the credit of the success of their mutual plans, and Matthew only to share the money reward—though in the majority of such cases it was Matthew's head that planned and was really responsible for success. However, that was between the two; and, if Grimlock chose to make such terms on occasion, doubtless he had reasons of his own for doing so. He now urged on the other to accept his offer of all instead of half, but Burrell stolidly refused. If a bit vain and pompous, the man was honest and had his own notions of what was fair, and "he liked to stick to them," he said. Finding it useless to argue the point, Matthew gave in, and the matter was arranged in the way Burrell desired. Matthew then told him what had taken place at the interview with Mrs. Chester and her daughter. "Still," said the Scotland Yard man, "I don't see that anything can be done. I don't see the doubtful points you hinted at." "The knife or dagger, or whatever weapon was used, has not been found," said Grimlock. "If someone else did it and tried to father it on Darrell, he would naturally carry away the weapon with him, lest it should afford a clue." "Well," said the other doubtfully, "maybe." "Then, when Darrell was searched, Arnold's pocket-book with some notes in it was found upon him. Now, though it is thought possible that he may have killed his friend in a homicidal fit, it is not suggested that he would steal his pocket-book and money." Burrell shrugged his shoulders. "In a fit like that a man is a lunatic of course, for the time being," he observed, "and might do any foolish or unlikely thing. I don't see much in that"
"Well, never mind anything else for the moment. What I really want just now is to know whether you can get me leave to see the prisoner. I want to hear his account of the matter now he is cool." "All right," Burrell replied, "I'll manage so much for you." And, after a little more talk, they separated; Burrell mentioning that the inquest was fixed for twelve o'clock next day. "Though they will be sure to take only just formal evidence and then adjourn—probably for a week," he added. "As usual, no prospect of help there—at present—save to get me an interview with the accused. Now, if Darrell did not do it, who was there in the house who might have done it? We'll leave outsiders out of the calculation for the moment. Thus we arrive at four possible persons, besides Darrell; Duncan and his friend Foster, Thomas Hedley, and Gustave, the servant. And these all declare they were out of the place all the evening and did not return till after twelve. Obviously, the first thing is to test the truth of their statements. That's what I'll set to work at, now, while the tracks are likely to be fresh." Accordingly, an hour later saw him at the scene of the tragedy interviewing the four above-named. Of them all he was least satisfied with the answers of Hedley. This man, as he learned from Duncan and Foster, was far from being steady. He was always more or less hard up, and frequently intoxicated. On the day of the murder he had had a violent quarrel with Arnold and had bounced out of the place uttering all sorts of threats against him. "And all," said Duncan, "because Arnold refused to lend him some money! Like his cheek! Fancy a man having the impudence to quarrel with you and threaten you simply because you refused to lend him money to go and squander, probably, in drink!" "How do you know this?" asked Grimlock. "Arnold told us so himself," was the reply. "Poor Arnold was an awfully good-natured fellow, and had often let Hedley have money before; indeed, this was the first time he had refused, it seems, and that, if you please, was the cause of Hedley's getting into such a rage!" Turning over some photographs while talking, Grimlock saw one of Hedley. "Is not this a photo of him?" he enquired. "Yes—that's Tom Hedley," Duncan returned. "Will you lend it to me for a day or two?" said Matthew. "Oh, yes! Take it altogether, if you like. I don't want it. The fellow's a cad—a pig—and, so far as I am concerned, I never wish to speak to him again." Thanking him, the detective took it and walked away. "If he's a boozer," he reflected, "he's pretty sure to be known at some of the public-houses round about. We'll have a look round and see what may turn up." Stopping at the first he came to after leaving the square—the "Three Boars"—he went in, and, ordering a glass of something hot, remarking that on such a day people wanted something to warm them, he soon got into a chat with the barmaid. Presently she left him to serve another customer, and, when she returned, she found him gazing with much interest at a photo he had taken out of his pocket. "Why," she exclaimed, "that's Mr. Hedley as lives at that house where that dreadful murder was last night." "Ah," said Matthew, replacing it in his pocket, "you've just about hit it. Do you know him well?" "I should think so! He's in here every day, more or less. To- day I offended him, and he was very nasty to me, and I shan't forgive him in a hurry. He'd no right to be, for I was only chaffin', and I have been a good friend to him sometimes." "Why, he's often been short, you know, and has run up a score here several times. He always paid 'em off sooner or later, but many's the time, when the guv'nor wouldn't let him have any more, I've managed it for him, pretendin' I didn't know, and so got into a row myself over it." "I see. But what was the matter to-day?" "Why," said the girl in an aggrieved tone, "I chaffed him, and said perhaps he'd done the murder hisself, and that might be how it was he was so flush of money last night all of a sudden, and he turned first pale and then red, and abused me, and then took hisself off in a temper, and I ain't seen him since." "But what made you say such a thing?" "Oh, it was only chaff, you know. His score had got rather high, and the guv'nor and he had words about it yesterday morning, 'cos the guv'nor had lent him a bit besides. And he'd promised to pay it back faithful yesterday. Instead of that, he came in in a great rage, mutterin' to hisself, and wantin' more drink on tick, an' the guv'nor refused, and they had more words. Well, last night he comes in, very excited like, and orders brandy hot, and pulls two or three bank-notes out of his pocket, and says to the guv'nor in a uppish way, 'Here you are. I told you you should have it to-day, and you see I've kept my promise after all, for all you was so nasty to-day!' And he had several drinks then, and stood the guv'nor and me some, and treated some others he knew who was in here." "What time did he come in?" "Just before twelve. I says to him, when I saw him, 'You are late to-night. What's the matter?' And he says, 'I've been sittin' writin' without a fire, and I'm very cold. Hurry up with that brandy!' and, before I could give him the hot drink, he takes up the brandy and swallows it down without even putting a drop of cold water to it." Evidently the girl was offended, or she would scarcely have chattered thus with a stranger; but Matthew knew how to draw people out, and had ingratiated himself with her by some aptly- turned little flatteries that had made her feel at least two inches taller. "So!" he muttered to himself when he walked away, "Hedley has told a lie to one of us. He tells me he went out about seven and did not return till after 12:30; and he comes in to this place suddenly flush of money and tells this girl he's just come out and has been sitting writing in the cold till near twelve. It looks fishy, Mr. Hedley—very fishy." And, shaking his head gravely, he set off to keep his appointment with Burrell, who was to go with him to Holoway to see Darrell. On their way up, after meeting him, he told Burrell what he had been about. "Looks very fishy," Grimlock commented. "Here's a man has a row with Arnold because he won't lend him some money. Goes out uttering threats against him, and goes into a 'pub' when he has not enough to stand himself a drink. Yet the same night he turns up—just after the time the murder must have been committed, you observe—greatly excited, and with bank-notes in his pocket. Then he tells lies—one way or the other—that's clear. What d'you make of that? Looks fishy, doesn't it?" "Well, yes, I must confess it does—only—"
"I don't see that such a man would be likely to have put the pocket-book with other notes into Darrell's pocket, as you thought to-day might be the case." "N—no. It seems a bit cloudy," Grimlock admitted. "Still— perhaps he didn't look into the pocket-book to see what was there, having found the others loose. Or, he may have purposely left them as a blind, you know." "Well, perhaps we shall hear something this evening that may throw a little more light on it," concluded Burrell. When they, after some delay, got to see Darrell, they found him sitting despondently on the side of his little bedstead, staring straight before him, the picture of abject misery and despair. He was a handsome young fellow with a pale, intellectual looking face. His fair hair clustered in curls over his forehead, and, with his large blue eyes and clear skin, he presented almost a boyish appearance. He had a frank, honest look when he turned his glance towards the two strangers, but showed no interest in their arrival, and looked away again with an indifferent air when the door closed behind them. It was some time before Grimlock could succeed in rousing his interest, or apparently gain his confidence; but, at last, the name of Rose Chester acted like a charm, and, once convinced that his visitors had come with really friendly intentions, he talked freely. "Do not be afraid, Mr. Darrell," said Grimlock kindly, "we are not here to 'pump' you or to use what you tell us against you. It is absolutely necessary, if we are to help you, that you should tell us everything—everything, mind. Conceal nothing—and omit nothing, so far as you can remember. What may seem trifling to you, will, possibly, turn out to be of vital importance. One moment, before you begin. Can you tell us what money poor Mr. Arnold had in his possession last night?" "Three hundred pounds," replied Darrell. "What, in notes? Are you sure?" "Quite. He showed them to me just before I left him." "Then where are they now?" said Grimlock, looking first at Darrell and then at Burrell. "God knows," replied Darrell. "Did you not find them on him? He had not taken his clothes off, you know." Grimlock looked at Burrell, who gave a long whistle. "Looks fishy, as you said awhile back," he exclaimed to Matthew. "Fishier and fishier, I reckon," was Grimlock's comment. "The scent begins to get warmer, I think." IV. — A STRANGE TALE. HERBERT DARRELL looked haggard and worn as he faced the two detectives and gave them his account of what had happened, and it was not to be wondered at, for, apart from the terrible position in which he found himself, he had had no sleep the previous night, and had been unable to eat the food that had been offered to him. Then he had been at the Police Court in the morning, where he had had to wait about in the cold till his case was called, when, after a brief, formal examination, he had had to wait again some time before a cab was brought to take him to Holloway. Grimlock asked him what he had done about a solicitor. "Dr. Selby has telegraphed to my uncle, Sir Ralph Linley," he replied. "I expect he will send his solicitor, Mr. Hardinge, of Gray's Inn, to me as soon as possible, and probably he will come up himself, for I am his heir. This terrible affair will upset the poor old gentleman sadly—almost be the death of him, I fear." "To make you understand how all this came about, I must go back to our unfortunate visit to Italy two or three years ago. George Arnold and I were there for nearly a year, and, after staying six months in Florence, went on to Rome and Naples, and finally to Sicily. There, out sketching one day, in company with some people we had scraped an acquaintance with—a small landowner of the country and his daughter—we were captured by brigands and carried off to the mountains. The chief of these wretches was a scoundrel named Loronio, well-known for his cold- blooded cruelty and the many murders he had committed. "For some reason or other—what it was I never exactly understood—Loronio refused to hold to ransom the old man and his daughter, and they were butchered before our eyes in the most horrible and shocking manner. We were absolutely compelled to look on; I suppose to intimidate us and help to make the letters we had to write to our friends more forcible. "It made an awful impression on me, so much so, that, when in due course we were ransomed and got back to our friends, I had brain fever, and have never been the same man since. I have fainting fits at times, and over and over again have I seen the frightful tragedy of those two murders re-enacted in my sleep. "After we had been freed, Arnold, who somehow had managed to take note of the route—I don't know how, since we were both blindfolded, and I never cared afterwards to talk to him much about it—himself led the soldiers to Loronio's retreat. The chief and some of his followers were captured, several killed, and the band of blood-thirsty miscreants was broken up and dispersed. "Arnold was a fine fellow! bold, strong, and intrepid as a lion; and, when he saw those two poor creatures butchered before our eyes, he swore he would not leave Sicily till he had revenged the hellish deed—and he kept his word. Afterwards, when Loronio was executed, he went and calmly looked on; then he had a wax mask taken of the dead villain's face, and bought his clothes and arms of the executioner, whose perquisites they were. These gruesome mementoes he brought back to England to use as realistic accessories for painting a picture of the capture of the gang. "That is how it came about that that hateful figure of the robber-chief, with its almost life-like face, was made up. To me it has always been horribly repulsive. It brings back and keeps green not only the recollections of the cold-blooded atrocity I was compelled to witness, but the memories of the torturing dreams and nightmares I had during the fever. "It was the only thing poor George and I disagreed about. He could not realise the horror the sight of the figure always inspired me with, and used to try to laugh me out of it. After he had painted one picture and sold it, he started on another—this time choosing the scene where Loronio condemned the two to their terrible deaths." "This second one was finished a week ago, and old Moseley, the picture dealer who had bought the other, agreed to buy it also and to give the same price, viz., three hundred pounds. He sent for it suddenly two days ago, saying he had a buyer he wished to show it to, but he did not send the money yesterday as he had promised, and Arnold sent Gustave down to him with a note about it. Gustave brought back a verbal message to the effect that, if Arnold would go down himself in the evening, at seven o'clock, Mr. Moseley would pay him. Arnold did so, returning about eight, when he said that old Moseley had paid him in notes instead of by cheque." "What is Moseley's address?" asked Grimlock, producing his note-book. "14, Stanley Street—just off Buckingham Palace Road." "During the last three or four weeks I have had three strange and horrible dreams, in each of which that hateful effigy of the brigand chief was somehow mixed up. The first was vague, the second more distinct, and the last—two nights ago—still more clear; and these dreams had intensified the horror with which I had always regarded the lay figure. I hated to go to the studio, and when there, I would not on any account sit with my back to it. I used to draw the curtain across it, so that I should not see it; and, during the last few days, I have begged Arnold again and again to let me destroy it. Last night, when he came back with the money and showed me the notes, I said, 'There! now you have sold the picture and been paid for it, you don't want that affair any longer. Now let me smash it up and put an end to it. It haunts me and I cannot stand it.' I took down the broadsword and went towards it to slash it to pieces, when he sprang up and took the sword from me and drew the curtain across to hide the figure. 'There,' he said, 'don't be a fool. I'll have it sent away to-morrow, but don't spoil it. It's too good for that.' Ah, heavens! How I wish now I had been quicker; but the fact is that I hesitated a moment, and that gave George time to stop me. And no wonder I hesitated!" Here he again passed his hand over his face in a dreamy fashion. "Because I saw it move! I could have sworn that, when I moved towards it, it winced! I told Arnold so, but he would not listen to me." Grimlock stared and Burrell glanced at him and touched his own forehead unseen by Darrell. "But," said Matthew, "what are you talking about, Mr. Darrell? Do you seriously mean what you say?" "I am as sure of it as that I am sitting here," was the reply given with great earnestness. "Oh," replied Darrell, "he came in in the morning and asked Arnold to lend him £20. Arnold simply said he hadn't got it, and Hedley had the impertinence to say that that was a shabby excuse, for he must have the money because the picture was gone. Of course that set Arnold's back up and they had a deuce of a row. If I'd been Arnold and had had his physical strength, I'd have kicked the fellow downstairs. Yet he was so good-natured, that, in the evening, when he referred to it, and I spoke rather hotly about it, he only said, 'Oh, never mind. Poor beggar. I suspect he was hard pushed. I am sorry now I spoke to him as I did!" "He must have been an uncommonly good fellow," observed Grimlock. "He had more patience than I should have had." "He was a good fellow," returned Darrell. "Yet, all the same, he was firm and stern enough in punishing those cut- throats." "Makes him all the better in my eyes," was Grimlock's response. Then he added with a sigh, "It makes it all the more sad to think of his death." "You may well say that," Darrell answered. "I cannot even yet seem to realise it. It's too cruel!—too shameful!" Grimlock eyed him narrowly, as indeed he had throughout, and could not find it in his heart to doubt his sincerity. Burrell's eyes were directed, as usual, to the ceiling. "Arnold used to have only the studio before I joined him, and he slept there, having shut off the bed with curtains as you now see it; and, when I came and we took the rest of the floor, and had a spare room, which he could have had as a bedroom, he still preferred to sleep in the studio, saying it was warmer in winter- -when there was a fire—and more airy in summer. Why he should have gone to sleep there last night with his clothes on I cannot tell you, but think, perhaps, he intended to stop up to do something, for he was going away early to-day, and just lay down to have a few minutes' rest and watch the fire—it was a habit of his that—and that he must have dropped off to sleep unintentionally. And now comes the terrible part. I went to bed, but could not sleep—"
"What time was it when you went to bed?" Grimlock interposed. "About ten or a little after. As I was saying, I could not sleep. I dozed a little, then woke up with a start; in those dozes I was haunted by that figure in the studio, and when I woke I was oppressed by fear and presentiments of some impending evil. At last I felt I could bear it no longer, so I got up, lighted a candle, partly dressed, and determined to go into the studio and see whether all was right. Not to disturb Arnold, if he were in bed and asleep, I did not put even my slippers on. When I got to the door, I opened it so quietly that it made no sound. The lamp that hung from the ceiling was still alight, and, in spite of myself, I glanced first towards the other end of the room and the figure of the brigand was gone!" "Yes," said Darrell slowly and with evident effort. "Then gazing slowly round, my eyes fell on the bed, and I here I saw—"
"I saw it standing beside the bed, and I saw Arnold lying there asleep with his clothes on and on his back. It had its arm raised, and, even before I could cry out—so stricken was I with horror—the arm came down. I saw the gleam of a blade and heard an awful groan. Then I know I must have fallen down in one of my fainting fits, for I remember no more for what seemed a long—a very long time!" "When I came to myself, the curtains were drawn across the space around the bed and I was almost in the dark. For a minute or two I lay still and tried to think. Then the whole horrible scene came back to me, and I know I must have fainted again, for, when I seemed to wake up the next time, the curtains were drawn back and the first thing I saw was that devilish figure sitting motionless in its usual place, as though it had never moved. Then the sight that met my eyes when I turned them to the bed, made me think of nothing but poor Arnold, and I went to find out whether he was dead, for I could see the blood and felt instinctively he had been murdered. I know that I cried out more than once for help, but no one came for what seemed a very long time. I spoke to George, called to him, and implored him to speak; I rubbed his chest and his arms thinking to rouse him, and was just on the point of going for assistance when Gustave came bursting in. He rushed out again and brought the others—and—you know the rest, I suppose. I made an end of that fiendish figure—but all too late. Never, never, never shall I forgive myself for not having done it earlier in the evening. Had I only done so, George would have been alive now!" When Darrell had finished his weird and fantastic story, he buried his face in his hands again and rocked to and fro in an agony of convulsive throbs. As to his two listeners, they made no comment, being divided between their feelings of amazement at the wild improbability, not to say sheer impossibility, of the account he had given, and surprise at the lucid, connected, almost convincing manner in which it had been given. For some time no one spoke, and only the sobbing gasps that burst every now and then from Darrell broke the silence. "There is one thing I almost forgot, indeed I hardly recollect it properly now, but you wished me to mention every little thing. When I got to Arnold's side, one arm was in the air with the fingers closed. I opened them with some difficulty and took out a small piece of something—I don't know what, and I can't think now what I did with it, But I have an idea I placed it rather carefully somewhere, thinking even then it might be, as you say, a clue. But I cannot think now where I put it." BOTH Grimlock and Burrell remained silent for some time after Darrell had finished speaking. Evidently his account afforded them both much food for thought, for in many respects it had come as a surprise to them—it was so circumstantial, so entirely free from the incoherences and inconsistencies that they had looked for as evidences of a disordered brain. Matthew Grimlock, in particular, felt fairly puzzled; though, never for a moment, did it occur to him to place any belief in the main point of the story—that which alleged that the murder had been committed by the figure representing the defunct brigand. Finally Burrell asked Darrell whether he could give them any idea of what it was he had taken out of the dead man's hand. "Was it a piece of cloth?" "No," was the reply, given decidedly. "Nothing soft, I am sure." "N—no," Darrell answered, but with more of hesitation. "Yet, it felt smooth, as smooth as a button might be." "Larger than a shilling, but scarcely so large, perhaps, as a two-shilling piece, I should say. There were vases and pots here and there, I may have dropped it into one of them." This seemed all that could be arrived at on this point, and Grimlock turned to another. "Are you certain you fainted twice, and that the first time you came to yourself the curtains were drawn round you, but that on the second occasion, they had been pulled back?" "I feel positive it was so." "H'm!" was Grimlock's expression of puzzlement. After a few further questions, the two took their leave and walked away together. When they had got some distance on their way, and were in a quiet road, Grimlock asked his companion his opinion of the extraordinary story they had heard. "Cracked," was Burrell's curt statement of belief. "H'm—well—yes, sounds wild enough, in all conscience. Yet, you know—suppose—"
"Oh, it's no use supposing anything," was the other's blunt reply. "He dreamed it all, every bit, except the stabbing. That's only too real." "Yes," Grimlock agreed, with a sigh. "But it's a strange affair, and gets stranger the further you go into it. But what about Hedley? All this about ghostly lay figures that walk about and stab people in their sleep almost put him out of my head, for the time. It's quite possible that someone else did the stabbing after all, and our friend here may have dreamed all he says he saw just the same." "Yes, that's possible, quite possible, and would fit in with the rest, especially since the notes have disappeared," assented Burrell. "Or—here is another theory: someone comes in and finds Arnold dead and Darrell in a swoon, and he sees the pocket-book, takes out most of the notes, but leaves two or three on the chance that in the confusion it might never be known that the dead man had so large a sum in the place." "Yes," replied Grimlock, "that, too, is just possible. One thing is clear, this affair is not going to turn out quite so simple and easy as it looked at first sight. Gad! I should like it to come out all right for Darrell. I like him somehow; he seems so boyish in his talk and feelings. Well, I'm off now down to Mr. Moseley, to get the numbers of those notes, and give notice about them." And, shaking hands with the other, he left him and got on to a 'bus bound for Victoria Station. But he had his journey for nothing, the man he sought not being at home. So he left word he would call again next morning. That evening he visited the Alhambra, and standing about outside after it was over, saw Gustave come out with a good- looking girl, evidently a foreigner, leaning on his arm. Quickly recognising Grimlock, Gustave lifted his hat. "Ah, Gustave," said Grimlock, "here again to-night, eh? You must be fond of the Alhambra to care to go two nights running." "Mais non, M'sieur, that is, yes. I find myself so triste—so distrait. I could not stay indoors." "Just so," Matthew rejoined, and started off for his home. "Rather odd I should have expected he would be there to-night," he said to himself, and he rubbed his hands with a satisfied air, as he walked along. "Another one I've found out in a lie," he went on presently. "He wasn't at the Alhambra last night at all; but, having said he was, he went to-night to see the performance, in case he should be asked questions about it at the inquest tomorrow. Cunning fox! But I'm still more cunning, my good friend, Gustave; and I can trip you up yet over this on a point I suspect you haven't thought out." That night, before he went to bed, he scribbled and posted to Burrell a note which ran thus: "You had better make Gustave (Arnold's servant) clearly understand he will be wanted at the trial, and must not leave the country; and do not trust to his promise, but have an eye kept on his movements." "There! mon ami français, as you call yourself," he said. "That fixes you safely for the present, I take it." And Grimlock went to bed apparently in high good-humour with himself. At the inquest next day, as Burrell had anticipated, only formal evidence was taken. Darrell was not brought there; the jury viewed the body, that the coroner might give his certificate for burial, and further proceedings were adjourned for a week. Gustave gave his evidence glibly; how he had spent the evening at the Alhambra, and on returning, had gone into the house with two of the other tenants, and on leaving them, had proceeded to his own room at the top of the house. Then, thinking he heard his master call him, he had gone down to the first floor and into the studio, where he had found Mr. Arnold lying on the bed with blood on his clothes, and Mr. Darrell standing over him. He had then run downstairs and called the two gentlemen he had come in with. And that was all he knew. He was not asked any questions. Mr. Duncan and Mr. Foster confirmed Gustave's statement so far as they were able to; and the police officers followed. Then Dr. Selby briefly told all there was to tell of the wound from which George Arnold had died, but stated that he had not yet finished his examination. On leaving the coroner's court, Grimlock was touched on the arm by Dr. Selby, and, turning round, saw that he had with him an elderly man whom he introduced as Sir Ralph Linley. He was a fine-looking specimen of an English gentleman, tall, upright, courteous in speech and manner, and usually brisk and cheerful, but to-day he looked subdued and troubled. "Can you come round to my house and have a talk with Sir Ralph?" asked the doctor. "He is very anxious to have a conference with you." And, upon Grimlock's assenting, the three walked to Dr. Selby's residence, which was in the square not far from the studios. After they were seated in the doctor's study, Sir Ralph turned to Grimlock, and asked him his opinion of the strength of the case against his nephew. "I don't know what to say," he said. "I fear the poor fellow's in a tight place—a very tight place. In some respects, too, from all I can gather, he has made matters worse by the wildly fantastic tale he has told—about the real murderer's being the dressed-up figure, you know." "But," observed Sir Ralph, "if he believed it to be so, what else was he to say?" "Ah, yes. But, you see it only confirms the theory of the police—that he is not responsible for his actions. Now, if he had simply said that he went in and found his friend dead, and had tried to revive him, and so on, no one, I fully believe, would ever have doubted his story. No one would have thought it likely he would kill his friend. He has given himself away. His impossible story, and his insane attack upon the lay figure showed at once that he was not in his right senses, and—well, there you have it all!" Sir Ralph stroked his beard thoughtfully. "I see what you mean," he replied. "Yet our friend the doctor here, who knows Darrell well, will tell you there is no trace of insanity about him." "None, so far as I have ever seen," responded Dr. Selby slowly; "but, of course, my opinion does not help matters much, situated as he is now. Grimlock, tell us frankly what you think, and what you are hoping to do." Grimlock again shook his head. "I can see only too clearly," he declared, "better to-day than I did before, how disastrously he has given himself away by this absurd story of his. I am trying to find out what has become of a lot of bank-notes that Arnold, it seems, had in his possession; but, you see, even if I succeed, it does not help us as it might, but for that unfortunate story about the figure." "Why?" asked Sir Ralph. "If you find a man who has stolen them, surely the presumption would be that that man must be the murderer?" "No. He might have come upon the scene accidentally, and at first innocently, after Arnold had been killed, and while Darrell was lying in one of his swoons. Then the temptation to rob the dead man might have proved too strong, especially as the blame would be thrown (so the thief might argue) upon the murderer; or the notes might never be missed at all in the confusion that, he would know, must ensue upon the discovery of the murder. Do you follow me?" "But," said Sir Ralph, in a despairing tone, "that is as much as to say, sir, that nothing can save him. That, even if you find the thief and bring the robbery home to him, my poor nephew will still have to bear the brunt of the murder. Surely, sir, that cannot be? It is too horrible—too horrible!" "There is only one chance, and that is, I confess, a poor one," was Grimlock's answer. "If I can spot the thief, and have reason to believe he is the actual murderer as well, I may be able by some scheme, some trick, some stratagem, to induce him to confess. I may possibly frighten him into it. Candidly, that is my only hope, so far as I can see at present. Of course, at any moment things may take a turn, and everything assume a different complexion. In these cases one never knows. If it had not been for what I have referred to, I should have said confidently, 'When I find the thief, I will show you the murderer;' but now, I can say no more than I have just explained." "He is my nephew, and has been like a son to me," he said. "Always affectionate and dutiful and considerate. This is a terrible blow. It is too cruel. I cannot even yet realise it or believe in it. Can you make no suggestion to aid us, doctor?" Dr. Selby shook his head sorrowfully. "My trust, so far as earthly aid goes, is in our friend here," he replied, indicating Grimlock. "I see the force of his argument, and fear he is only too near the truth. Still, if any man in London can find 'a way out,' that man, I feel sure, is Matthew Grimlock. When he sits down to bring his brains to bear upon a case, it is very seldom indeed that in the end he has to confess himself beaten." An hour later Grimlock was comparing notes with Burrell, who had, however, no additional information to give him. "I have two or three things to tell you," observed Grimlock. "In the first place, I have got the numbers of the notes from old Moseley, and, in the second, have seen the note paid to the landlord of the 'Three Boars' by Hedley. It is one of those Moseley paid to Arnold." "Ah! That has an ugly look for Mr. Hedley. Still, I don't see that you can do anything there just at present." "No," Grimlock admitted discontentedly; "we must wait awhile and keep an eye on him. That's all we can do, I suppose." "Speaking of 'keeping an eye' on people, what's the meaning of your note that I had to-day about that fellow Gustave? Anything up with him?" "Only this. Do you remember that Mr. Foster and Mr. Duncan told us he (Gustave) said he had been to the Alhambra, and that they spoke particularly to him about the favourite dancer there, Carina?" "Well, it struck me that, if that had been a made-up tale, as I know it to be, he would be likely to go there last night to see the performance, so as to be prepared for any questions that might be asked about it. So I went there myself last night, and was fortunate enough to run against him." "I see. Good idea! But what made you suspect him of not speaking the truth about it?" "Because I had discovered, that Carina did not dance that night. She was ill, and a public apology for her absence was made in the house. So, Gustave could not have seen her, as he pretended. You see, my friend, I do not leave many stones unturned." VI. — ROSE MAKES A SUGGESTION. THE following day Matthew Grimlock was seated again in his private office, when Perkins announced Sir Ralph Linley and Mrs. Chester. They both, on entering, shook him warmly by the hand, but there was that in their manner that told Grimlock at once they brought bad news; and, upon his inquiring after Miss Chester, they informed him very gravely that she was seriously ill.
"I am staying at Mrs. Chester's," explained Sir Ralph, "while this sad business is about, and I am sorry to say it is a house of grief at present in every way; and, amongst minor troubles, there have been mysterious disappearances of jewellery of late. But we do not purpose to trouble about that while there are such far more pressing things to be thought of. Have you any news?" "Nothing of moment. May I ask what is the matter with Miss Chester? Though, of course, I cannot profess to be surprised that she should show signs of suffering under the great strain she must be enduring." "Ah, yes," the mother replied; "but this, I am sorry to say, is something more than that. Something we do not understand, and we are in very great anxiety about her. I did so hope you might have been able to give us some little piece of re-assuring news— something that I could take back to her and that might cheer the poor child a little." "And I wanted to say, Mr. Grimlock," said Sir Ralph, "that I hope you are doing everything that money can do—that is, that you are not sparing money in this matter. If you will let me know what I can do in that way, I will supply whatever is required." "I will tell you when I want any, Sir Ralph," Grimlock answered; "and that reminds me—I am glad you called—I have a suggestion to make. The man Gustave, who was Mr. Arnold's servant, is making a fuss about having been told he must not leave the country. He says he wishes to go to Paris to get employment, now that he has lost his situation here with Mr. Arnold. It is rather an awkward point. Of course we cannot legally detain him, and—well, I was going to suggest, had we not better keep him on and pay him for the present—even for doing nothing. Pretend he is to look after the studio, or something? That would take away his excuse for going. I assure you I think it very important, most important, that we should not lose sight of this man just now." "Certainly, sir, certainly. A very good idea. I will pay him the same wages he was having," Sir Ralph declared. "Very good. Then I will so arrange it. May I ask whether you know anything of Mr. Arnold's people?" "Why, of course; though yesterday, they were at the inquest you know, they cut me dead—his father and brother. The sister, Emily, was not there. I suppose they feel bitter against poor Herbert. But I think it was bad taste to show it in public, like that. It was assuming his guilt, sir, it seems to me, before he is tried." "Yes, sir, I agree with you it is to be regretted," Matthew responded. "Do you know when the funeral is to be, sir?" "Yes; to-morrow I heard. At Highgate Cemetery, I am told." "Can you give me their address? I may have occasion to go to see them." "'The Limes,' Westdean Road. It is not far from Hampstead Heath." Grimlock noted the address down, and his visitors rose to leave. "Can you give me no hopeful message to take back to my daughter?" Mrs. Chester asked. Grimlock looked troubled. "It is too soon to speak yet. I can say no more than that, I am sorry to say," he returned. "I have a message to you from my poor child, Mr. Grimlock, though I hardly like to give it to you. I do not know that I would, only that she is so ill—for she is very ill. It is that she begged you would come to see her. I must tell you this illness has come on suddenly; she was taken ill last night. Yesterday we had an interview with poor Herbert—Mr. Darrell; I suppose it must have upset her." "Of course I will come, Mrs. Chester, if you think it best," was Grimlock's ready response; "I shall be only too pleased to do anything I can to comfort her, and, perhaps a chat with me, and an assurance that I am working hard in Mr. Darrell's behalf, may cheer her and do her good." "Oh, thank you so much," the widow gratefully replied. "When will you come?" After his visitors had left, Grimlock proceeded to the address that had been given to him—that of the Arnolds'—and arrived there in the afternoon. It was a large, rather grand-looking house, in somewhat extensive grounds of its own. Looking from window to window he saw that the blinds were all down, for poor George Arnold had been carried there before being taken to his last resting-place. He had some difficulty at first in gaining admission, but an explanation that he was a detective engaged in the case eventually effected what he desired, and he was shown into the drawing room, where he seated himself, and waited patiently for some little time before anyone appeared. After a time, however, an elderly lady came in, followed by a younger one, the daughter Emily, as Matthew surmised, of whom Sir Ralph had spoken. The elder lady, Mrs. Arnold, was austere and distant, but the younger one, though she said little, and had evidently been crying, seemed, he thought, a pleasant-looking girl. "You are a detective engaged in this case," said Mrs. Arnold, eyeing him haughtily. "Yes—that is, one of them," he answered. "There can't be much for more than one to do, or for one alone, for the matter of that, I should have thought," she said ungraciously. "From all I hear, the thing is clear enough. The wretched murderer—"
"Be quiet, Emily. I know what I am talking about. He has brought trouble enough upon us—too much for me to waste any pity or sentiment upon him." "But, mamma, it is not proved yet that he did it; and, if he did, poor fellow, he did not know what he was about. Really, mamma, you ought not—"
"No more, Emily. What is it you want, sir?" turning to Grimlock. "Simply this, madam; Sir Ralph Linley and Mrs. Chester called- -"
"How is Mrs. Chester?" interrupted Emily. "She was well, Miss Arnold, but Miss Chester is very ill."
"Oh, I am sorry. Mother, can't I go to see her?" "No; certainly not. Will you keep quiet and let me hear what it is this—er—gentleman wants." "It has been arranged to keep on Mr. George Arnold's servant, Gustave, for a time. And I called to explain to Mr. Arnold that everything will be taken care of; I will see to that. But, as he is already aware, the police take charge for the moment. I speak of the time after they have gone. I suggest that, in the interests of justice, it may be desirable to leave things on the footing I speak of for a while, till matters are more settled. I will be responsible for all the things there. Here is my card, in case Mr. Arnold should like to call on me to make enquiries, or in case he should wish to write to me." And he rose to go. "Very well, sir, I will give your card to Mr. Arnold, and tell him what you say. Good-day!" She went to the bell as Matthew moved towards the door, when the daughter said, "I will see the gentleman out, mamma;" and hastened out into the hall before her mother could stop her. When Matthew got to the door, she whispered, "Will you see Rose—Miss Chester?" "Yes," he answered. "Tomorrow morning." "Give her my love," she said, "and say I will come to see her in a day or two—the moment I can, whether mamma likes it or not." "A nice, kind-hearted, affectionate girl," was Grimlock's comment while going down the steps. "But the mother! Ugh!" And he shivered as though someone had poured iced water down his back. When he called at Mrs. Chester's the next morning, that lady received him with a friendly, but anxious greeting. The house was a large one, facing Kensington Gardens, and from the bow window of the room on the first floor, into which he had been shown, there was an extensive view of the water in the gardens, now crowded with skaters. "You will have to see my daughter in her room, Mr. Grimlock," said Mrs. Chester. "She is too ill, poor child, to be up." And she led the way upstairs to the bedroom where Rose lay. Grimlock had been prepared to see her looking ill, but was surprised and shocked at the sight that met his eyes. She had grown fearfully thin in the time, her eyes were large and unnaturally bright, and a feverish spot glowed in each cheek. She was sitting up in bed supported on pillows, and smiled faintly at Grimlock's approach, raising her hand and extending it to him. "It is so kind of you to come, Mr. Grimlock," she said in a weak voice. "I wanted to see you so much. I could not rest till I had told you what I wish to say." "You shall tell me, Miss Chester," he replied. "But first tell me how you feel to-day, and how it comes about that I see you like this. I fear you have scarcely been acting up to the promise you made to me, to keep up a brave heart, you know, eh?" She smiled again, rather sadly. "I tried my best," she declared, "and truly I cannot understand how or why it is I have broken down. But now I wish to talk to you—I have ever so much to say, and hardly know where to begin. First, have you any news?" "Well, now, I want you to be very, very kind and indulgent to me, and not be offended at what I am going to say. I am only a girl, you must remember—and it is not as though a man said it." "Nothing you say can offend me in any way, my dear young lady," Grimlock said kindly. "Be sure of that. I shall know that it is only dictated by the great anxiety you feel, and the desire to suggest something, or give some hint, that may be of use." "Exactly, Mr. Grimlock. That's just what I wanted to say, only I could not think of the proper words. Now what I fear is that you may be wrong here, and lose precious time, because you do not believe Herbert's story." Grimlock, in spite of himself, gave a slight start. "How do you know that?" he asked. "What makes you think so?" "Oh, I know. I feel it. And he told me so himself, for one thing. Of course, it is a strange story, but"—and here she gazed at him very seriously, with large solemn-looking eyes—"you must believe it, for I feel it is true—every word of it." "But it can't be," exclaimed Grimlock, surprised into argument. "How can a made-up figure go stalking about killing people, my dear young lady?" "That is just what you must try to find out," she answered quite calmly. "That is the problem that has to be solved. But, if you do not believe in it at all, you will never set to work to think it out. Do you see what I mean, dear Mr. Grimlock?" Grimlock smiled pleasantly. "I see that you are giving me quite a little lecture in my own business," he said. "But I'm not prepared to say you're wrong. You've hit one fundamental point anyhow—a detective should never start with the idea that anything is impossible. And, so far as that goes, I may have made a mistake perhaps." "Well, you see," she went on, "I know Herbert so well, and when he declares solemnly that he saw that figure stab poor George Arnold, you may be sure it was so. It was no dream. And, besides, who pulled the curtains backward and forward?" "Go on, Miss Chester, I am listening." "Mr. Grimlock," she said, taking his hand and looking at him very earnestly, "I believe it must have been true what he says. I want you to believe it too! If you give your mind to it, youcan find out how it might be; but, of course, I am not clever enough to think it out." "Do you believe it was the ghost of the dead brigand animating his clothes, and doing all this to revenge himself, and to steal two or three hundred pounds in bank-notes to take away with him to the other world?" Grimlock asked, smiling. She looked at him dreamily. "No," she replied, "I scarcely think that. I did not know about the notes." "Oh, yes, there is a large sum missing." "Herbert wouldn't steal!" she exclaimed indignantly. "Of course not; we know that." "Have you found the knife yet?" she asked. "Would not 'the figure,' if it killed anyone, use its own dagger?" she asked again. "Have you looked to see?" And Grimlock sprang up exclaiming, "No one seems to have thought of that!" GRIMLOCK paced up and down the room for a brief space before saying anything further. The suggestion thus made had evidently started a train of thought in his mind that seemed to him worth consideration. Soon, however, he sat down again by the bedside saying, "When I say that no one appears to have thought of what you suggested, I can only speak of what I know. It is just possible the police may have looked at the dagger fastened in the belt round the figure made up like the dead brigand; but, if so, I think I should have heard of it. I rather fancy, however, that we have all passed this over, looking upon the weapon as only a harmless bit of 'stage property;' forgetting, or not knowing, that it is the actual dagger that belonged to the wretch. In any case, I will make sure about it, and am much obliged to you for reminding me. And, to show you I mean what I say, and also to try to relieve your anxiety in some measure, I will promise to do what you have asked me. I will examine the whole business from a fresh stand-point." Rose, who had half-raised herself while he had been speaking, leaned back upon her pillows, when he finished, with a satisfied sigh and an air of relief. "Thank you so much, Mr. Grimlock," she said; "I hope you will soon find it all out now. I listened so carefully to all Herbert told me, and I seemed to feel it was all true. There is still something more. The piece, or whatever it was, that he took out of poor Mr. Arnold's hand. Might it not have been a button or something torn from the dress of the model? You see that becomes possible, if you once admit that he actually saw what he says he did. Will you not look carefully and see whether anything is missing?" "Certainly, certainly. As you say, Miss Chester, one thing leads to others, when once you start on a new line. Gad! you ought to have been a detective yourself!" "No; it would never have suited me, such an occupation. I don't like the idea of hunting people down. Only here, for Herbert's sake, it is different." Seeing she looked fatigued from the talking, Grimlock prepared to take his leave. After giving her renewed assurances, he spoke of his visit to Mrs. Arnold and the message Emily Arnold had sent. "Ah, yes, I knew she would want to come so soon as she knew I was ill," she declared, a sweet, pleased smile lighting up her face. "It is very sad that they should feel bitter against poor Herbert, especially when he never did it. But I hope you will be able to convince them soon, Mr. Grimlock." As Matthew walked downstairs he shook his head in a dissatisfied way. "I don't like her looks at all," he said to Mrs. Chester at parting. "I wish you would let Dr. Selby see her." "He lives so far away, you see," was the reply, "otherwise I should have called him in. The doctor we have is close at hand." At his office Grimlock found Burrell waiting for him, and saw at once that he had some news to tell that did not please him. "Why, I'm afraid we're on a wrong track as regards Mr. Hedley. I think it's what you call a case of 'No thoroughfare.'" "Look at this. Found it amongst Mr. Arnold's papers." "There is no date to it. It may relate to a former loan." "No," he replied. "I found it mixed up with a letter dated only the day before the murder. Part of the fly-leaf was torn off and this I. O. U. is the missing piece. It just fits it." "Then why has he prevaricated about the matter? There must be some further mystery here. Suppose we go and question him together? I want to go to the studio again to look at something." Accordingly the two made their way once more to the quiet square and to the house that had been the scene of the tragedy, and, after ascertaining that Mr. Hedley was in, proceeded to interview that gentleman—apparently much to his discomfort. "Mr. Hedley," he said, somewhat sternly, "we have reason to believe that you have not spoken the truth concerning the death of Mr. Arnold and your relations with him. Now, of course, you need not answer any questions unless you like; but, if you decline, we shall feel bound to conclude that you have something to conceal; while, on the other hand, if you are innocent in the matter, and wish to assist the ends of justice, you may speak to us freely. You will be ill-advised in concealing the truth from us; already you have only brought suspicion on yourself." "We know that you have changed a note which must have belonged to Mr. Arnold." "He gave it to me—or rather lent it to me. I don't expect you'll believe me, but it's the truth." "How much did he lend you and when?" asked Grimlock. "Twenty pounds. I met him outside about eight or half-past. I gave him an I. O. U. for it. I scribbled it in pencil under the lamppost on a slip of paper he tore off a sheet he took out of his pocket." "We do believe you," he returned, "for we have found the I. O. U. What we cannot understand is why you should not have spoken of this before. And why you told an untruth by declaring you had not seen him since your stormy interview of the morning." At the first part of Matthew's reply, Hedley had brightened considerably and had looked visibly relieved; but, at the end, his face again grew clouded, and he wiped it repeatedly with his handkerchief. "There is something else. But, if I were to tell it, no one would believe me, any more than they have believed Darrell." "Why don't you speak out?" he asked. "You are only bringing suspicion on yourself." "I will tell you. And, if you laugh at me, or don't believe me, well, I can't help it. As I have just told you, I met Arnold outside, accidentally. I was going to pass him without speaking, when he stopped me. 'I say, Hedley, old man,' he said, 'don't be upset with me about this morning. I assure you it was true—what I told you— that I had not then got the money. Now I have, and to prove to you that I do not mean to be unfriendly, I can let you have what you want now, if you like, on condition, of course, that you return it as usual.'" "What did that mean?" Burrell inquired. "Oh, I have an income paid to me quarterly. I had often borrowed of Arnold before, and always paid him back as soon as I got my payment in. There had never been any delay on my part, or a word between us. That was what upset me when he said he could not do it this time. I quite thought he had had the money for his picture, and that he was telling me an untruth as an excuse." "Not very nice on your part," observed Matthew bluntly, "towards one who had been a friend to you before." "N—no; and I'm very sorry now for it; indeed, I was before I had been out of the house half-an-hour after the row. That was why I felt too ashamed to speak, and should have passed without speaking in the evening, if he had not stopped me. I think I must have been excited by some brandy I had had on an empty stomach that morning. "H'm! Well, I'm glad to hear you see it in the right light now, anyway," Grimlock remarked. "However, go on." "You cannot speak more strongly about it than I feel myself, I assure you," Hedley returned. "Indeed, I felt very small and very much ashamed as I have said; so much so, that, when I came in about eleven o'clock, I determined to go and speak to him, if he were still up, and tell him I had not said nearly so much as I thought I ought by way of apology. I found all so quiet that I walked almost on tip-toe along the passage; the outer door was not fastened and the inside passage, as you know, is covered with cocoa-nut matting. I thought, if he had gone to bed, I would not disturb him. When I got to the door of the studio it was ajar; I pushed it open quietly and looked in, and there I saw—"
Here Hedley stopped and wiped his face again. "Well?" said Grimlock impatiently. "What did you see?" "You'll never believe it," Hedley went on in an agitated tone, "but I swear it to be true. I saw the figure of the robber chief standing down on the floor with its back to me! And I saw that it seemed to be looking down as though at something held in its hands. I saw it move stealthily back towards the platform, and then—then—I was seized with a mortal terror. I drew the door lightly to and crept away softly upstairs to my room and threw myself on the couch. I really believe I must have fainted, or something, with sheer fright, for I seemed to wake up to find myself very cold My idea then was that I had been asleep and dreamed it all, and I went out to get something hot to warm myself up. I shall never forget the turn it gave me." And again Hedley mopped his face. "You must have known, Mr. Hedley, of the statement made by Mr. Darrell; of how it has been ridiculed and disbelieved, and has only gone to strengthen the theory that he dreamed it all and killed his friend in his dream. You must have known of what inestimable service this statement of yours would have been as tending to corroborate his extraordinary account; yet you say nothing about it till we come here and almost drag it out of you!" "Or a fit of the D.T. 's," suggested Burrell grimly. "Well, altogether, there is no doubt I lost my head; and very sorry indeed have I felt about it all. It is a relief to me to tell, at last, all I know." "If you saw Mr. Arnold between eight and half-past," asked Grimlock, "and went back about eleven, where were you meantime?" "I went down to 'Verrey's' and had dinner; then to the 'Horse Shoe' and had two or three games of billiards. You can inquire at those places; they know me well enough at both, and will remember my coming in, because it was the first evening I had gone to either for more than a week." "I suppose you changed a note to pay for your dinner?" "Yes; I had two £10 notes. The other I changed later with Tompkins at the 'Three Boars.'" "Why did you do that, having the change of the other in your pocket?" "Oh, I don't know. Just to impress him, I suppose. We'd had a difference in the morning because I owed a score there, and I thought, perhaps, it might make him more civil if I showed him a £10 note instead of a sovereign or so." "I see. Well, now can you fix the time when you returned and looked into the studio?" "I heard eleven strike while I was crossing the square. It was very quiet, the streets being covered with snow, and I remembered thinking what a lot of clocks there seemed to be striking all at the same time." "Did you notice whether Mr. Arnold was lying on his bed then?" "I did just glance, but could not see, the curtains being drawn round it." After this, Burrell asked a number of questions and cross- examined Hedley at great length. He, however, elicited nothing further of any moment. VIII. — THE CIRCLE NARROWS. WHEN the two detectives left Mr. Hedley, they went downstairs into what had been Arnold and Darrell's rooms. Burrell had the keys, and, giving that belonging to the studio to Grimlock, he went himself into Darrell's bedroom. Presently, coming into the studio, he found Grimlock examining with some excitement the dagger he had taken from the made-up figure. "Why," said Burrell in surprise, "I never knew that dagger was real! I thought it was only a sham affair, like those they have on the stage." Grimlock laughed—a dry, half-mocking sort of laugh. "The fact is, Burrell," he said, "we have all been a set of fools over this business. We've had the thing under our noses all the time, and like jackasses we wouldn't look at it, till it was reserved for a girl to put me on the right scent. Now Hedley's story has merely corroborated certain points; I came here quite prepared to believe something such as he has told us." Burrell stared, and gave a shrill whistle. "Man alive!" he exclaimed, "Have you gone silly, too? You don't mean seriously to say you believe all this moonshine about that model?" "I'll tell you later what I believe," returned Grimlock. "Meanwhile, look at this blade and look into the scabbard. There's been blood on it—and recently too! Been wiped—but hastily. This must go to Dr. Selby for him to examine and report upon. Can't you see, man," he exclaimed impatiently, "that this is the dagger Arnold was killed with?" Burrell stared vacantly at the weapon for a while, and then said, "Ah, ah! I see. Darrell used this and replaced it—and then goes and smashes up the figure and so puts us all off the scent. Artful! artful! Talk about method in madness, eh! Mad people are as clever as sane ones, when they like—and a jolly sight more cunning!" Matthew moved testily away, and picked up the wax mask that lay on a table near. Then he went carefully over the clothing of the figure. "It's a pity he interfered with it," he muttered. "Makes it more difficult. Still there are no buttons missing, only a slash or two in the tunic, and a chip out of the mask. I wonder where that chip went to!" And he began carefully searching around on the floor. "Are you sure," he asked Burrell, "that no one's been here since? No dusting or sweeping, or anything been going on, eh?" "Quite. I have had the keys all the time myself, and whoever wanted to come in here had to come with me." "You did not see or hear anything of a piece of wax that would fit the piece missing from here?" and he pointed out the place. "We were very particular," he declared, "in looking round for pieces or chips or any bits that might be about. What was picked up we put into this bowl here. You see there's nothing there like what you want." Grimlock spent sometime in a further careful search, and eventually gave it up, and the two went away, Burrell carefully locking up as before. "Now Burrell," said Matthew, when they left the place, "I want to see Herbert Darrell again. Can you manage it, do you think?" "Yes, to-morrow, if you can go up with me. I will call for you at your office, if you like." "I shall expect you," returned Grimlock as they shook hands. The next morning Sir Ralph came early to Grimlock's office with bad news. Mrs. Chester had been taken ill and was in bed with symptoms similar to her daughter's. The poor old gentleman seemed half distracted. "Nothing but trouble and grief!" he exclaimed. Grimlock looked grave. He drummed with his fingers on his desk, as was his habit when in thought, and stared vacantly out of the window. "Have you any news?" Sir Ralph asked. "Nothing to tell you, Sir Ralph," was the answer. "I saw Mrs. Arnold and mentioned the arrangement about Gustave." "Ah!" observed the baronet, "It is the funeral to-day. I should have liked to go to it, to show my regard for poor George. But, of course, I cannot compel them to allow me. But Miss Chester has had a hasty note from Emily Arnold saying she is coming to see her on Monday morning." "I am glad to hear that, Sir Ralph. I think she will cheer up the young lady, perhaps, especially now Mrs. Chester is ill, too, and cannot be with her. I do wish, Sir Ralph, you would call Dr. Selby in." "I will, if things do not get better," Sir Ralph declared. "I'll do it on my own account. I know him—and this other doctor I know nothing of." It was not long after the baronet had left before Burrell arrived. His face showed at once that he had some news. "Traced one of the notes!" he exclaimed. "Whom do you think to?" Burrell's face fell. "Hang it! I thought to give you a surprise," he said. "I have been expecting it; and, if it had not come about, was going to propose a little plan to you to trap him. However, it's better as it is. Saves trouble and time, my friend. Tell me how it came about." "Gustave, it seems, frequents a low German club of a sort in Soho, and goes in pretty heavily for cards and gambling. Lately he has been particularly reckless, and has lost a good deal. Hearing that, I set one of my fellows on to play with him—as sharp a lad as the 'cutest' sharper he is, he won some money, and to pay him Gustave wanted to get change of a note at the bar. But my lad chipped in and offered the change for it and got the note." "But then," Burrell went on, "here's a curious thing; Gustave, it appears, has been well known at this club for a long time, and has, at times, lost a lot of money there. I wonder where he got it?" "Quite so," he observed meditatively; "I expected something of that, too." "If you had any such ideas, you didn't let me know of 'em," he grumbled. "No harm in that," retorted Matthew; "anymore than there was in your instructing your man to lead Gustave on at play without telling me." "Well, that's true," said he. "Now let's be off." They found Herbert Darrell looking even more dejected than before. Sir Ralph's solicitor, Mr. Hardinge, had but just left him and had informed him of Rose's illness. He scanned Grimlock's face keenly when he came in, but could gather nothing from the impassive features. After some preliminary talk and inquiries, Grimlock came to the object of his visit. "Where," he asked, "did Mr. Arnold pick up the man Gustave?" "I scarcely know," Herbert answered. "He came, I fancy, and offered himself as a model first. Brought his sister as a model, too!" "Yes—so he said. After a while, he used to do odd jobs about the place for us. He said he was a waiter at a restaurant in Soho, part of his time. One day he told us he had lost his waiter's place, and asked George to engage him altogether, and he did so." "Well, no, not exactly; I believe he gave a reference to the place at which he had been employed as waiter; but whether George ever troubled to go there or write, I really do not know. By that time we had got pretty well used to his being about the place, and so were not so particular as we might otherwise have been." "Really, then, you know nothing about him?" "What countryman is he? Mr. Duncan says he speaks Italian as fluently as French." "I can't say as to that," he replied. "But he always said he was French." "Now," continued Grimlock, "about that piece of something that you say you took out of your friend's hand. Can you recollect anything further about it?" "I have been trying to recall it," said Darrell, passing his hand over his forehead with the old dreamy look; "but, somehow, it evades me. Sometimes I seem to have it on the tip of my tongue, as we say, but then it slips from me again. No; I cannot tell you more about it than I told you before." "Was it anything like a button, or a—er—er—"
Mr. Burrell had taken out his pocket-book and from it had withdrawn a small piece of paper, which he carefully unfolded. "Was it anything like this" he asked triumphantly. "Yes, I am nearly sure that is it!" And, looking at it, Grimlock saw that it was a piece of hard wax such as might fit the place they had noticed in the wax mask the previous day. "Where did you get this?" he asked in a reproachful tone. "I had a hunt last evening in Mr. Darrell's pockets," the other explained. "You know at the time of the murder he was wearing an old jacket, and he changed it for other clothes before coming away. I took possession of the jacket and of what was in the pockets, which was not much. I thought I had gone over it carefully enough, but on a more careful examination last evening, I felt something hard down inside the lining. I found the pocket had a hole in it, and, after some trouble, I fished out this and a piece of pencil." "You might have told me this morning," said he. "Thought I'd wait till we saw our friend here to make sure," replied the other with a chuckle. "Well, I am only too pleased to see it," Grimlock said. "This is a great corroboration of your story, Mr. Darrell, wildly improbable as it looked at first sight; and it is not by any means all the confirmation we have obtained. Altogether I may say, for the first time, I begin to hope we shall clear the mystery up." "I'm with you there," said Burrell heartily; "I begin to think so too." "Just then the door opened, and Darrell was informed that Mr. Hardinge wished to see him again. "We'd better go, then," Grimlock observed; and the two went out, leaving Herbert Darrell in far better hopes and spirits than when they had come. "You begin to believe there is something in Mr. Darrell's story then, at last?" "Yes. But you needn't crow. You were only about twenty-four hours ahead of me, you know, and you admitted yourself that you were put on the right road by a young girl. Only shows," remarked Burrell sententiously, "how the females are crowding out the men in every walk of life. They'll be having female policemen soon." "I never asked him further about that girl," he exclaimed, "and whether he knows where she is now. Your springing that wax business on me and Mr. Hardinge's coming back put it out of my head. Darrell says she was supposed to be his sister; but I'll bet she is the same I saw him with at the Alhambra, and the same he spoke of to Mr. Duncan as his sweetheart. Now, why, at twelve o'clock last Tuesday night, did he think it safe to speak the truth about her and own up that she was his sweetheart—or wife, maybe?" "Ah, why indeed!" echoed Mr. Burrell. IX. — A HOUSE OF SICKNESS. THE curtains were partly drawn across the window, and the blind was lowered in Rose Chester's room to keep out the light. For she was much worse, and could not bear the bright sunlight that came into the windows in the front of the house. The invalid glanced up expectantly at the door, when some one entered, then looked away again with a disappointed air. It was only Ninette, her French maid. "I was almost in hopes it was Miss Arnold," she said wearily. "I do hope she will be able to come." "It is scarcely time as yet, Miss Rose," answered then maid. "Yes, it is better she come, and come soon. Sir Ralph ill now too. Nobody seems to keep well. I shall be next, perhaps." "It is dreadful, Ninette. I cannot understand it. So much trouble all at one time seems terribly cruel." "Ah, it is ze influenza, la grippe c'est ça. It is very, what you call catching." "The doctor says he does not think it is influenza, Ninette. But there, influenza takes so many forms nowadays. Even the doctors seem to know nothing about it. Hark! There is a knock. Perhaps it is Emily." "Perhaps it is ze other doctare. Sir Ralph sent a message for him." "Dr. Selby? I am glad of that. I like him best. Though Dr. Tanner is very kind, too. No, it is Emily. I hear her voice." Emily Arnold came in quietly, but with a face full of eager anxiety. She was dressed in deep mourning, and looked pale and thin. "Oh, my darling, my darling!" she exclaimed, throwing her arms round Rose. "Oh, dear, what bad news! Three of you ill! And you—oh, I did not think you were so bad. I had such trouble to get away; but, now I am here, and see how ill you are, and how bad things are all round, I shall just stay and nurse you. They may say what they like at home. There!" And she proceeded to take off her hat and cloak. "Permit that I help you, mademoiselle," said Ninette. "Ah, Ninette! Is that you? How is it you are not nursing Miss Rose better, so as to have made her well before this?" "Truly, I not know, miss. I do all that the doctare say." But it is la grippe, you see." "Indeed, Emily," said Rose, "Ninette has been most kind and attentive. I don't know how we should have got on without her. She is in and out of the sick rooms one after the other, all day long, and all night, too, almost, giving us each our medicine at the right times, and seeing to everything. She is as good as three nurses, I do believe. Emily dear, you don't believe that about Herbert, do you?" "No, my darling. I can't believe it. There must be some hideous mistake somewhere. How stupid of these detectives, who think themselves so clever, not to have been able to find out the truth about it before this! The suspense is cruel." Then Emily went away for a little while to see Mrs. Chester, and, by the time she came back, Dr. Selby had arrived. Very grave he looked as, after interviewing the patients, he sat alone in the library downstairs, sipping a glass of sherry that had been brought to him by the butler. He shook his head dubiously while he wrote out three telegrams; then he left the house to send them personally. "This is a bad business. I'll trust no one," he said to himself. One telegram was to his assistant; another to a nurses' institute, asking for two nurses; and the third to Matthew Grimlock, begging him to come up at once. When he returned to the house, he announced his intention of staying until the nurses arrived. Then he went in to Sir Ralph, and sat chatting to him; but, every now and then, he would go to see his two other patients, to give them the medicine he had sent for, with his own hands. Towards the afternoon the two nurses arrived, and were installed in charge, Ninette being now relieved of her arduous duties, and told she was to go and lie down, and try to get some sleep. But Grimlock did not arrive, and the doctor declared he should wait for him. He sent off another telegram to his private address, urging him to come the first moment he could, no matter if it were late at night. He had a long consultation with Dr. Tanner, who had been attending the patients previously, and must have satisfied that gentleman that he, Dr. Selby, was acting for the best, for the other showed no signs of objection. Emily sat by Rose's bedside, outwardly cheerful, but inwardly with a terrible heart-sinking. Rose's appearance had startled and shocked her, and made her feel more anxious than she dared say; and now the doctor's proceedings had confirmed her fears. She, too, had sent a telegram. It was to her mother, saying she should stay all night to help nurse her friend. "Let them come and fetch me, if they like," she said stoutly; "I shan't go, even if they do." "Emily dear," she said to her suddenly, after lying a long time almost in an unconscious state, "if I should die—"
"Oh, darling, darling, don't talk like that!" Emily exclaimed passionately, seizing Rose's hand and kissing it. "Perhaps I may not, dear. But I feel so weak, and I have an idea I must be very ill, from Dr. Selby's staying here all day. I was going to say, if I should die, I want you to be a friend to that poor girl, Ninette. She has no one to take care of her except her brother, and he can't do much for her. She is here in a strange country almost alone. She was trying to earn money as a model, you know, when she came to us. And you cannot think how kind she has been. I know mamma would look after her; but mamma might die, too, you know. I want you to promise you will not forget her, for my sake." Emily, who had burst into tears, and was sobbing softly to herself, pressed her friend's hand and kissed it. "You might take her for your own maid," continued Rose, "if you could get your mother to allow you. You would never find a better one. She has been so attentive to me all the time I have been ill. All the time! It is not a week yet, since that dreadful affair! A week to-morrow! Think of it! It seems months, years, almost!" Grimlock did not come until the evening. He had been out all day on very particular business connected with Mr. Darrell's case, he told Dr. Selby, and had not received his telegram till late in the afternoon. He listened to what the doctor had to say with his usual impassiveness; was told how Sir Ralph was now added to the list of sufferers; and, in reply to Grimlock's queries, Dr. Selby did not hesitate to state to him his own opinion. "What do you think I can do?" Matthew asked. "I want you to send someone you can rely upon at once. A 'third nurse' let her be supposed to be. There are three patients. We want one for each really. You understand?" "I will send Mrs. Grimlock," said he, with a significant look at the doctor. "She has a nurse's dress, I know, and you may trust her to keep an eye on everybody all round." "Go at once to fetch her," Dr. Selby urged. "I'll telegraph. That will be quicker still," returned Matthew. "And I can stop here then and help you. I know my wife's at home." "Good. You will find me here when you get back." Grimlock went out on his way to the post office, which was a few streets off. Walking quickly, in turning a corner, he brushed against a woman, who was also walking quickly in the opposite direction. In passing, he just caught a glance at her face, and, in a moment, he stopped short, to see her disappear round the corner. Turning back, he peered cautiously round and watched her; then, finding she did not look back, he followed her, keeping on the other side of the road. Two or three minutes later, he rang the bell and was re- admitted to Mrs. Chester's house, much to the doctor's surprise. "You have been quick," he observed. "I haven't been," returned Matthew. "Came back unexpectedly. The fact is, I ran against a woman whose face I recognised, though I only got a glimpse of it under a lamp-post; but that glance was sufficient to induce me to follow her. She came to this house, and was admitted downstairs. Just inquire who she is, will you, doctor, and what she is doing here?" Dr. Selby rang the bell, and, when the butler appeared, inquired whether he knew who it was that had just come in downstairs. "Only mademoiselle, sir," was the answer. "Who is she?" inquired Grimlock. "Ninette; Miss Rose's maid, sir. She has been kept indoors very close at nursing, and, when the other nurses came, she was told she could take a rest; but she said she was not tired and would rather go out for a walk." "I see. And where is she now?" "Gone up to her room to lie down, sir." "Very good. That will do, thank you." Matthew remained a minute or two deep in thought after the servant's departure. He walked to the fire and held out his hands to the blaze in an absent way, nodding his head gravely at nothing in particular. "Doctor," he said presently, "how far have matters gone here in this devil's work? Are you in time?" "I am in hopes so," was the reply, given somewhat hesitatingly. "That is, as regards Mrs. Chester and Sir Ralph. Miss Chester's case I am most anxious about. She is very weak." "Now," said Matthew, "I can put my hand on the she-devil who has caused all this. She is upstairs now, you understand. But it does not suit my purpose that she should be alarmed just yet. Of direct evidence we have none; and, if she thinks she is suspected, she will be off and give the alarm to another bird I am hoping to lime to-morrow. Do you see? Can we keep her here, with safety to your patients, till the morning of the day after to-morrow?" "I should say so. Especially with the help of Mrs. Grimlock," Dr. Selby answered. "Very well, then. I see my way now, and will go and send that telegram." X. — ALONE IN THE STUDIO. 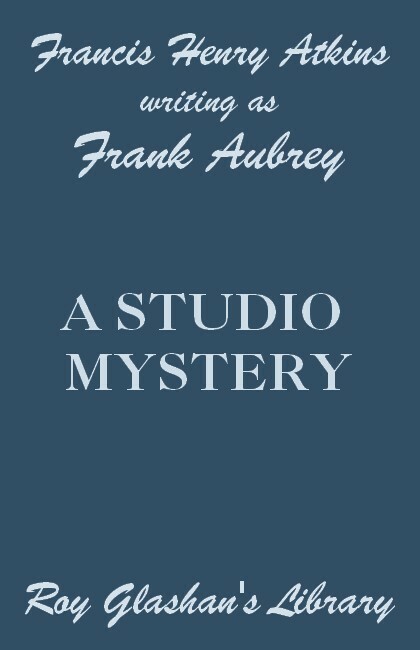 THE night following Dr. Selby's timely discovery of the state of affairs at Mrs. Chester's, Grimlock and Burrell sat talking in the studio that had been the scene of George Arnold's tragic death. The place had been "swept and garnished;" a bright, cheerful fire blazed in the grate; the lamp that hung from the ceiling threw down a warm ruddy glow in a circle underneath its crimson shade; the rest of the room being in semi-shadow lighted up at intervals by transient gleams from the firelight. Everything around was in neat order and primly arranged, save, perhaps, the bed, which, being now no longer in use, was heaped up with rugs, and the curtains that had formerly enclosed it. These had been taken down and thrown carelessly on the bed. The figure of the dead brigand sat in its old position; but its head, with the wax mask, was off, and was resting by its side. In other respects it had been renovated; and now reminded one somewhat of the appearance the original might have presented after the execution. Grimlock sat poking at the fire with a bit of stick, in thoughtful and somewhat gloomy mood; while Burrell smoked stolidly at a cigar and seemed to be intent upon nothing beyond gazing up at the ceiling above him. Just when the clock at the large building in the square chimed out a quarter to ten, Grimlock looked round at his companion. "Nearly time he was here," he said. "I hope he's coming." "Time enough yet," answered the other. "Ten or a few minutes before, I said." "What's the place like where he is living now—you've been there, of course?" "Oh, yes. You bet. Searched it too, but no go. Too cunning for that. It's near that club he goes to, that I told you of." "I only hope this will come off to-night," he continued after a pause. "Yes, we shall look rather foolish, if it doesn't, shan't we?" "Ah, it isn't only that! It's a question of life and death, as I do truly believe. That poor girl, Miss Chester is in the most critical state. Her life hangs by a thread, Dr. Selby declares. If I could take her good news to-night, who knows but it might be the means of saving her life? I should be glad to be able to go up there to-night and say she need have no further anxiety." "Aye; I can understand. But what a diabolical wretch that woman must be! Hanging would be too good for her!" "Too good! I should think so. You don't know how kindly, almost affectionately that poor girl spoke of her. It almost brought the tears to my eyes, and that's no easy thing as you know. Ugh! it makes me sick to think there are such wretches on the face of the earth. If I had my way, I would sentence her to imprisonment for life and to be publicly whipped through the streets twice a week. Ah! And I would do the whipping myself, too, if no one else would!" Then they were both silent again for awhile, till a knock at the front door was heard. "I'll go down and let him in," said Grimlock. He went out and soon returned accompanied by Gustave, who advanced towards Burrell with two or three deferential bows, and then remained standing near the door with his back to the bed. He was smiling and serene apparently, but his colour came and went, and his eyes wandered uneasily round the apartment taking in everything—the lamp, the dressed-up figure, the old-fashioned clock on the mantelpiece which, as he noted, had been set going. Nothing escaped his restless eyes. Matthew Grimlock stood with his back to the fire, and his hands behind him, and regarded Gustave with a look that was rather benignant than otherwise. "Gustave," said he, "we all know how faithfully you served your poor master, and how devoted you were to him," here Gustave bowed appreciatively, "and thus it comes about that I have prevailed on our friend here," indicating Mr. Burrell, "to let me have an interview with you here instead of—at the Police Station." At this ominous reference Gustave's face looked much less appreciative. "The fact is," Grimlock went on, "a Bank of England note has been traced to you, that, it is known, was in the possession of your late master, Mr. Arnold." Gustave's face cleared somewhat. He had expected this and had a plausible story ready; only he was not aware of the system of numbering by which particular notes could be traced. "Certainement," he replied readily. "Monsieur Arnold was going away. He owe me my wages, an' he give me ze money, in what you call nots." Grimlock smiled pleasantly, and turned to Burrell, lifting his hands as much as to say, "There, I told you so." "However," put in Burrell, "other notes are missing and you are suspected. Now we could take you up on suspicion—seeing that there was reason to suspect you about this other note—and have you searched at the police station, and while you were detained there, we could go to the lodgings you have moved into since you left here, and make a search there. But my friend here has wished me to save you this indignity—at least till we see further cause. "Therefore, if you like to submit to be searched here now, by us, and consent to our going to search also at your lodging, and we find nothing further, you can go away and no one will know anything about it." "Mais, m'sieu'. C'est mauvais ça. I like not such things. And I assure you I have no more of ze nots." "Then why object to what our friend has so kindly suggested?" Matthew asked. "Well, I've considered long enough," said Burrell roughly, and rising, "Come on, Grimlock. You meant well, I dare say, but I can't waste time here any longer. Call a policeman and we will take him to the station and search him there." Grimlock moved towards the door, but Gustave stepped forward and laid a hand on his arm. "Stay," he said, "I will do what you wish. You will find I have told ze truth." They searched him accordingly, and found no notes, but discovered a revolver and a stiletto. "Hulloa" Burrell exclaimed. "What are you carrying these about for, eh?" "Ah, m'sieur, can you wonder? After what took place here, I not feel myself safe any longer." "H'm! Well, I shall take care of these for the present anyway. Now we are going to your lodgings." "Certainement, m'sieu'. But give me, please, my case of cigarettes." "Oh, yes, you can have that," returned Burrell, who had been carefully examining the case for concealed pockets. "Now, you will wait here till we come back; and mind you are here when we come back; No hanky-panky, mind. Don't try to bolt off, because we shall leave a policeman at the door!" "Wait hyare, sare!" exclaimed the astonished Gustave. "I come with you to show you—"
"No! You wait here till we return. We prefer to go alone." Then Gustave begged, entreated, not to be left alone, "in zat murdering house." It was of no use, and he had at last to submit. "It is now twenty past ten," observed Burrell; "we ought to be back here before eleven, for we shall take a cab, but, if we are a little longer, don't upset yourself on our account. We'll get back as soon as we can. You can smoke your cigarettes to help pass the time if you like." And they went out, closing the door behind them. Gustave listened to their footsteps as they walked noisily along the passage, banged the door at the end, and then went down the stairs. He heard the front door slam, and then all was still. He glanced round the studio, a frightened despairing glance, and then seated himself before the fire, and, taking out a cigarette, tried to smoke. But his lips and mouth were parched and dry, and he threw the cigarette away. Then he took out his handkerchief and wiped his forehead, muttering broken expressions to himself. He feared to look round, yet felt compelled to glance this way and that, till he wished he could take in all sides at once. Of all the things that he had thought of as possible or probable, the idea of having to pass an hour alone in this place was the most repulsive to him, and the last that had entered his head. Yet here he was; and he shivered when he cast his eyes furtively towards the bed. The figure of the bandit chief, too, to-night inspired him with horror. Sitting grim and motionless without a head, which was beside it, the suggestiveness of the death that had befallen the man whose effigy it was, was too obvious not to impress itself upon the mind of Gustave. Presently he turned his chair round so that he should be able to see both the figure and the bed at the same time. For he feared to take his eyes off one to look at the other. The ticking of the clock worried him, too. And, when the chimes rang out for half-past ten, he started up, and seemed as though he intended to make a dash for the door; but sat down again, helplessly. Thus the time passed. The clock ticked, the minutes passed, till a quarter to eleven chimed, and again he started up, and glanced in the direction of the door. Too well he remembered that that day week, at about that hour, his late master had been foully murdered in that room. He could not get his thoughts off that, do what he would. He wiped his face, he tried to whistle, but it was a vain attempt, and now he only watched the clock with one eye while he tried to keep the other on the two ends of the room. "If only," he thought to himself, "if only it gets past—Santa Maria! What was that?" These last words he uttered almost aloud, when what seemed like a heavy sigh echoed through the room. A few seconds of silence—dead silence save for the ticking of the clock, then another heavy sigh, followed by a deep, blood- curdling groan as of one in mortal agony. With a cry Gustave jumped up and rushed to the door. It was locked, and after trying it in vain and hearing no further sounds, he went back, and dropped rather than sat down upon the chair again. Another groan and sigh, and then the things on the bed rustled, moved, and slowly a form rose up and sat on the side of the bed, and there, in the shadow, Gustave saw plainly enough the face and form of George Arnold, with pale, bloodless countenance, and dressed as he had been when murdered; with the Norfolk jacket he had worn unfastened, and showing the white shirt-front beneath stained with blood! WITH eyes almost starting from his head and shivering with horror, Gustave beheld the figure place one hand to its breast, as though to cover the wound, while the other arm rose slowly, slowly, and pointed at him. His name was called in a choking, gurgling, half-suffocated voice that echoed through the room, and still Gustave sat still, unable to move. But when he saw the figure slowly rising to come across to him, he could bear it no longer, but rushed to the door beating frantically on it with his fists and shrieking for help. The door opened and he rushed out to be caught in the arms of the two detectives in the passage. "Mercy, mercy!" he screamed, putting his hands before his eyes and panting with fear. "Sauvez-moi, oh, messieurs, save me from le revenant." Then he looked round and saw the figure in the studio slowly following him. "Mercy, mercy! I will confess, I will confess, if you will but save me from him." "Confess what?" said Grimlock, sternly shaking him by the shoulder. "Did you kill him? Speak!" "Yes, yes. I confess it. Only save me!" Then the figure retired, and they dragged the half-unconscious man into the studio. When he looked round the figure had gone. Shivering with horror and fright, the wretched murderer confessed everything, while Burrell found paper and ink and wrote it down as he told his tale. When he had finished, the paper was read over to him and he signed it, after which Burrell and Grimlock signed as witnesses. Then he was taken away still more dead than alive and lodged in a police cell. When the two detectives left the police station, it was nearly twelve o'clock. Standing still on the pavement, at the first quiet spot they came to, Matthew took off his hat, wiped his face, drew a long breath, and gave utterance to a prolonged "pheugh!" "I say!" he said, "it's a relief to think it has come out all right, isn't it? It worked beautifully, and we've got him safe enough at last!" "Yes; thanks to your planning, old man. I don't forget that. I felt rather doubtful about it when you first suggested it, but, as you say, 'it worked.' "
"Well, now," said Grimlock, "I'm off to Bayswater as fast as a hansom can take me, to carry the news to that poor girl. I pray heaven I may be in time and that it may help to do her good. To- morrow morning, first thing, I shall be at Holloway to relieve Mr. Darrell from his anxiety. Then I must see Mr. Hardinge and explain matters to him." When he arrived at Mrs. Chester's, he found Dr. Selby and Mrs. Grimlock awaiting him. They both looked at him eagerly when he entered the room and his face answered them. "Succeeded, Jane!" he exclaimed, and turning to the doctor, he added, "Got him, doctor; confessed everything." "Heaven be thanked," Dr. Selby fervently answered. "This will mean much to my patients, to Miss Chester most of all. She is in a very critical state." But when Rose heard the glad news, its soothing effects were quickly exhibited, for she sank into a quiet sleep—the first natural rest since her illness began. It was some three weeks after the arrest of the man who had been known as Gustave that Matthew Grimlock was again seated in the house in the Bayswater Road, now giving Rose Chester, who had but just come down from her sick room, the full particulars of all that had occurred. Outside, the frost still held, and from the window one could still see crowds disporting themselves gaily on the ice in the bright sunlight. Looking out from the seat they had placed for her near the window, the young girl thought of the horror that had possessed her the last time she had gazed upon the scene from that window. And the tears came to her eyes—tears of thankfulness and gratitude—as she mused upon all that had passed. Sitting there, one hand held tenderly by Herbert Darrell and the other lying in Emily Arnold's loving clasp, all that had gone seemed now only like a hideous nightmare, and she could scarcely realise it had not been one of the fevered dreams of her illness. Matthew Grimlock had but just come in. He looked somewhat disturbed, the fact being that he had come to bring them the news that Gustave had committed suicide by strangling himself in his cell—a method of evading his earthly judges that did not meet with Matthew's approval. Ninette, too, had been discharged for want of direct evidence, and there was, therefore, an end of the case. "There is not much that you do not know, Miss Chester, I think," he had said in reply to a request from her. "Ah, but I wish to hear it from you yourself," she answered, looking at him admiringly. "You managed it all so beautifully, I think." "After you had put me in the right road," he said, a little discontentedly. "However, since you wish it, I will just run over what you have not heard direct from me, and I can also tell you some things I have only learned myself within the last day or two." "Then there is something fresh, eh?" queried Sir Ralph, who was sitting by the fireplace reading the Times. "Well, yes, I've picked up some further items concerning this precious couple. They were man and wife. Gustave's name is really Guido Loronio—"
Here the speaker was interrupted by expressions of surprise, and, from one of his hearers, of horror. "Yes. So it is. He was the brother and the lieutenant of the notorious Loronio whom Mr. Arnold had hunted to his death out in Sicily. His band was a branch of the dreaded Mafia, and you know how it is said of them that they have a long arm and never fail to try to revenge an injury done to one of their number, at least where they think they can. The Loronio family were Italian by race, but had gone to France and lived there for many years, then returned to Italy, and finally gone back to their native place, where these two brothers, getting into trouble with the authorities, took to the mountains and joined the Mafia. Thus they, the two brothers, were almost as much French as Italian. There is no doubt that, after the break-up of the band, Guido, or Gustave, and his precious wife came over to this country expressly to be revenged on Mr. Arnold and his friend. He himself told me so. The Mafia found the money—it was a vendetta and they took it up—besides which he had some means himself, ill-gotten gains I need not say. They wormed themselves into Mr. Arnold's confidence, and through him and Mr. Darrell, Ninette, his wife, as she is really, was taken by you as a maid, as you know." "It's astounding!" said Sir Ralph. "Talk of nursing a viper—"
"And I thought so much of her!" said the gentle Rose with a sigh. "Well," continued Grimlock. "Mr. Arnold would have been murdered long ago, and I have no doubt Mr. Darrell and you and others, too, if it had not been for Guido's insane passion for gambling. He staked and lost not only his own money but that given him by the Mafia—all this I got out of him a day or two ago—and therefore delayed his vengeance until a chance might offer of gaining some money as well. He got into trouble with the Mafia for the delay. They sent an emissary in the shape of an organ-grinder to warn him, and it so happened that Mr. Duncan, whom you know, overheard scraps of the conversation between them. He remembered it because he had not known before that 'Gustave' could speak Italian, but he did not, unfortunately, hear enough to learn what they were talking about. Ninette robbed you of jewellery, the proceeds of which all, or nearly all, doubtless went in gambling. Guido planned to carry out his infamous design two or three times, but drew back because of some difficulty or other, or because he could not see how to get any money by it. Then, again, he was anxious about his own safety, and could not see a way to carry out his purpose with reasonable chance of escaping suspicion, till Mr. Darrell put it into his head." "I?" exclaimed Darrell in astonishment. "Yes, sir. He heard you prophesying that harm would come through that figure of his brother. Heard you say you had had dreams about it and so on; and he conceived the idea of dressing himself up in the figure's clothes and mask, and so seeming—if you, or anyone else, should come upon the scene—to carry out your idea. He looked for it that that would frighten anyone away, or so terrorise him, that he would be an easy victim to deal with, while such a person's story, if he escaped or survived, would never be credited. "The opportunity he was waiting for came when he heard that Mr. Arnold would be paid for his picture that night, and it seems that old Moseley had incautiously shown him the notes in response to Mr. Arnold's message, which I suppose he took in a rather hostile spirit. 'Tell Mr. Arnold,' he said, 'not to be afraid I shall not pay him. See! I have the money ready. And if he comes for it this evening he shall have it.' Gustave took back this message and resolved at once upon action, and when he was alone in the studio, while Mr. Arnold had gone, he dressed himself in the clothes of his dead brother, hid the dummy figure away behind the canvas rocks and things, covered it over out of sight, if anyone chanced to look there, and then coolly sat down and waited patiently till his opportunity should come. Meantime he had got leave to be out for the evening, and when Mr. Darrell and Mr. Arnold came in he was supposed to have gone. Instead of which, he was sitting there before their eyes, listening to all that was said and seeing the notes in Mr. Arnold's hands." "Ah!" exclaimed Herbert, "did I not say I saw the figure wince when I walked towards it with the sword?" "You did, sir, and no doubt, as we all can see now, you were right. And a terrible fright the scoundrel must have been in at that moment. How he waited till everything was quiet and Mr. Arnold had gone to sleep, you can all understand; what, perhaps, you do not know is that he intended killing Mr. Darrell too. But when Mr. Darrell came on the scene and fell down in a swoon, a devilish thought came into his head of trying to throw the murder on to him. He therefore took out Mr. Arnold's pocket-book and placed it in Mr. Darrell's pocket, after taking all the notes except two, which, I suppose, he left for appearance' sake. But when he found Mr. Darrell did not come to, he concluded at first that he too was dead, so drawing the curtains round the bed, he proceeded calmly to resume his own clothes, putting the others back on the dummy figure and setting it again in its place. He had no idea but that the outer door was closed and locked and that he had the place to himself. Mr. Hedley, however, had found it open, and had just caught a glimpse of 'Gustave's' back when he was standing counting over the notes probably, before changing his clothes. When, finally, the villain was about to leave, he heard a slight noise behind the curtains, and, peering cautiously between them, saw that Mr. Darrell was moving; but even while he looked at him, the latter became still again. Then Guido pulled the curtains back once more to get more light by which to look at him, and finally deciding to leave him as he was, he hurried off, crept down the stairs, and stole cautiously out into the square, meeting no one on his way. There he loitered about till he should find someone returning to the house, and there being but one way of getting into the square, this part, as you know, would not be difficult to manage. When he saw Mr. Duncan and Mr. Foster coming, he hid away till they had passed, and then followed them, thus securing useful evidence, apparently, that he had been out and returned late. But when I heard he had stated that he had been to the Alhambra and seen Carina dance, it aroused my suspicions, because I happened to have been told by a friend, who had gone purposely to see her that evening, that she did not appear, an apology being made for her absence. I, therefore, went myself the following night and was fortunate enough to see him coming out with one, whom I afterwards knew as Ninette, on his arm. I felt sure he had come to see the performance that he might be able to describe it, if questioned." "Speaking of Ninette," observed Emily, "poor George asked us to take her at home at first; but mother did not want anyone at the time, and so it fell through. Then he spoke to Mrs. Chester about her." "It seems a shocking thing," said Sir Ralph, "that people should plan such atrocities; that they should nurse revenge not only against those who have crossed them, but even against their relatives who are innocent of all offence." "You are right, sir," replied Grimlock, "but I suppose it is the Italian notion of carrying a vendetta to its bitter end." "Now, I am anxious to know, Mr. Grimlock," Rose asked, "what put into your head that idea by which you frightened him into confessing." "Why, I admit there I took a leaf out of the scoundrel's own book. I determined to try on him a similar dodge to the one he had played off so successfully on us all. I know, too, that most people of his class and nationality are intensely superstitious, and it has often happened before that the very persons who are fond of playing 'ghost' on other people are themselves the most easily frightened if they see what they think a 'real ghost.' Putting these things together, I formed a plan. "There was no doubt, I reflected, that a great deal of the feeling with which our friend here, Mr. Darrell, regarded the lay figure of the brigand arose from the cleverness of the 'make-up' and its startling resemblance to life." "Ah," observed Darrell, "George took a lot of trouble about that. He went to Messrs. Tussaud and interested them in the work. They devoted much pains to it, especially to rendering the wax mask life-like, and the same with every detail." "Just so; I heard of that. Now, the first time I visited Mr. Arnold's house, I noticed a marble bust of Mr. George in the hall." "It was done for him by Mr. Layburn, the sculptor, who was a great friend of George's," Emily explained. "Yes, and a wonderfully good likeness it is, too, if I may venture an opinion. After—with some trouble—getting Mr. Arnold to lend me the bust, I took it to Messrs. Tussaud and explained to them what I wanted. They took the idea up with much kind interest, and, aided by photographs that I had also borrowed, they turned out a wonderfully clever likeness of Mr. George's face. It was quick work to do it in the time, I can tell you. Indeed, I marvel now how they managed it; but I was very anxious to increase the effect of the trick I was going to play on Gustave (or Guido) by arranging it for the same night week as that upon which the murder had been committed. I also so arranged as to make the critical appearance of the supposed spectre coincide with the time when the deed must have been actually committed." "Ah! How could you do that? And who was it played the ghost?" Rose inquired. "I got an actor, a friend of mine, to take the part of the ghost, and, to settle the right time I had set the clock going in the studio. I knew that, sitting there alone, in that place, the rascal would have a deucedly unpleasant time of it. That he would watch the clock anxiously, and show increased excitement as the critical moment drew near. My friend was watching him all the time from under the curtains and things we had piled over him, and could pretty well tell from the fellows manner when the proper time had arrived. We had taken good care to remove from the place everything in the shape of a weapon that could have been used—even to the fire-irons, and we had taken the precaution to search Guido before leaving him. It was well we did so, for he had a pistol—to say nothing of a murderous-looking stiletto. Of course, Mr. Burrell and I never went out of the house, but crept back quietly and listened at the studio door till the right moment came to open it." "It was very cleverly planned and carried out," said Sir Ralph. "Be sure both you and Mr. Burrell shall have no cause to complain of my liberality in settling up. But how did you get the villain to talk so and tell you what he did?" "He was very sulky at first, Sir Ralph, but he grew anxious about his wife. Begged me at last to try to get her sent back to her own country. I, on my part, quite agreed with him that (since we could not punish her) that was the best place for her, so, on my promising to do what I could, he became more communicative." "I think you have managed it all splendidly, Mr. Grimlock," exclaimed Rose. "As for myself, I can never, never thank you or feel grateful enough." Matthew shook his head with a dissatisfied air. "There is one point—one mistake I made," said he, "as to which I feel as if I shall never forgive myself. That is about Ninette. Had I but asked Mr. Darrell about her, as I ought to have done, much of the danger and suffering you and your friends have undergone would have been avoided." "Never mind that now. All's well that ends well, Mr. Grimlock," said the baronet cheerily. "And now come and have some lunch with us." Herbert Darrell and Rose are married, and living in the country with Sir Ralph. He could not make up his mind to let them live away from him; and Herbert had no desire to go back to the studio that had such painful memories for him. Indeed, he now only paints a little occasionally for amusement's sake, his position as Sir Ralph's heir making him independent of his former profession. They sometimes have visitors in the persons of Mr. and Mrs. Grimlock, with whom Sir Ralph is always ready to talk over all the incidents and events of the anxious time they passed while Matthew was working out for them the mystery of George Arnold's death.